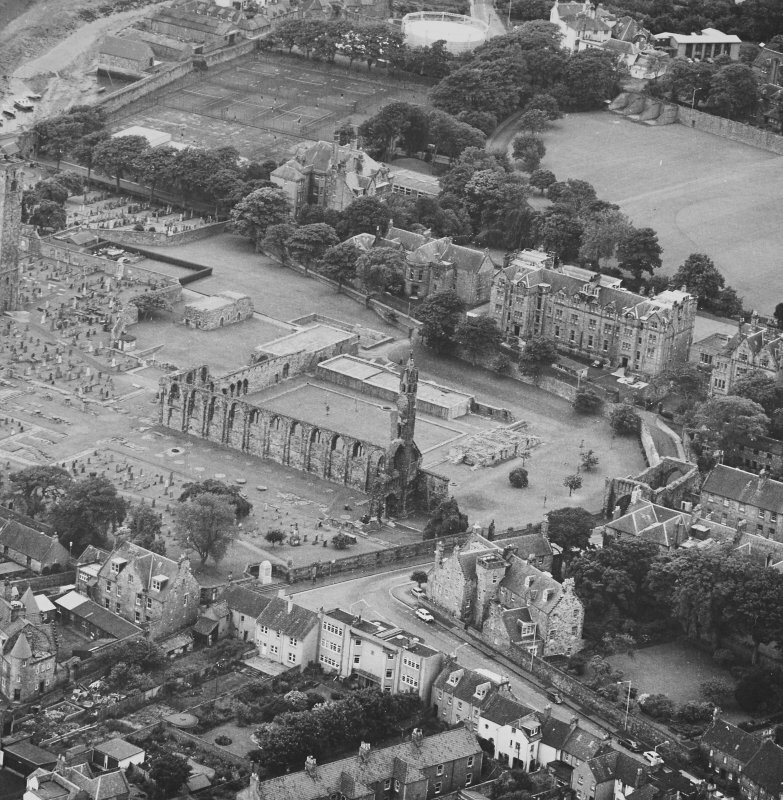 Oblique aerial view including Cathedral from North West. 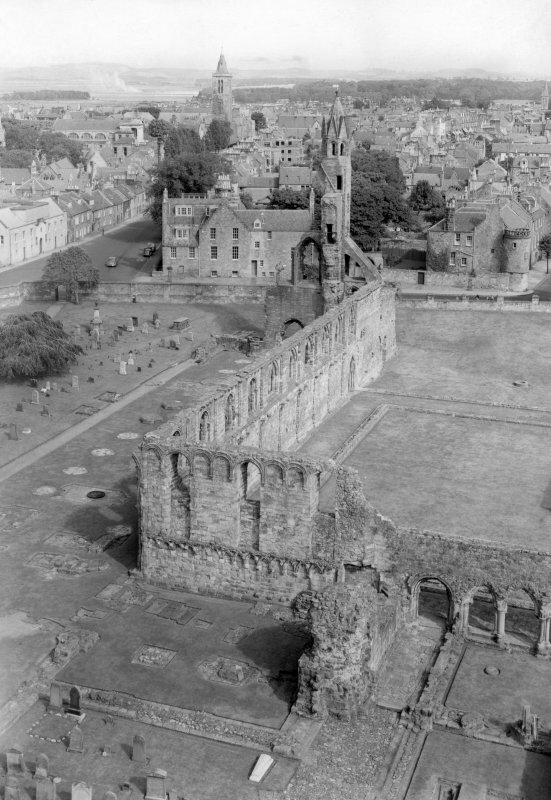 Oblique aerial view of St Andrews centred on the cathedral with castle adjacent, taken from the S.
General view of museum interior. 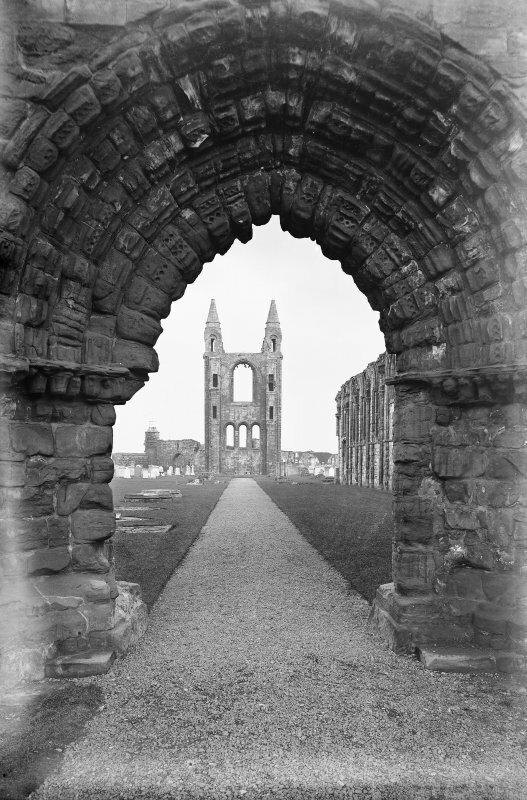 Details of lower windows in west end of nave, St Andrews Cathedral. Looking along south aisle to St Regulus. 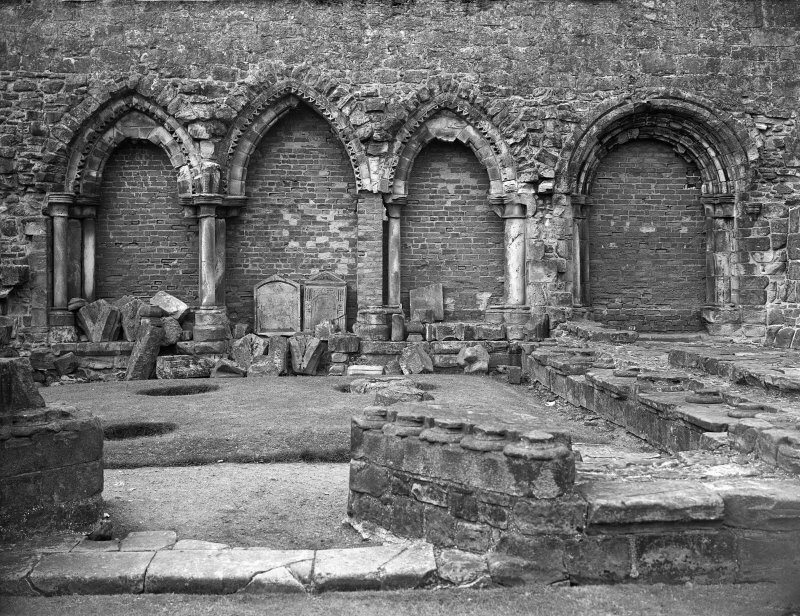 Excavation next to south aisle. 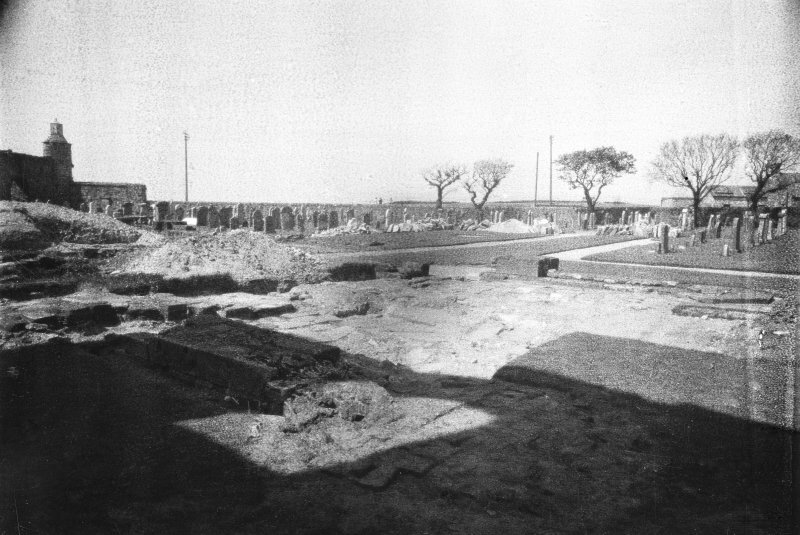 Looking west along south aisle, excavation work. 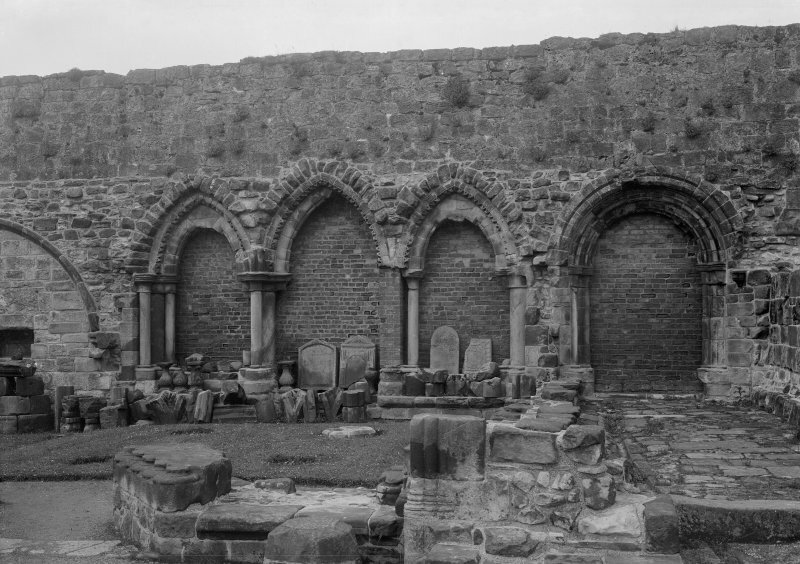 South aisle, East Tower & St Regulus. 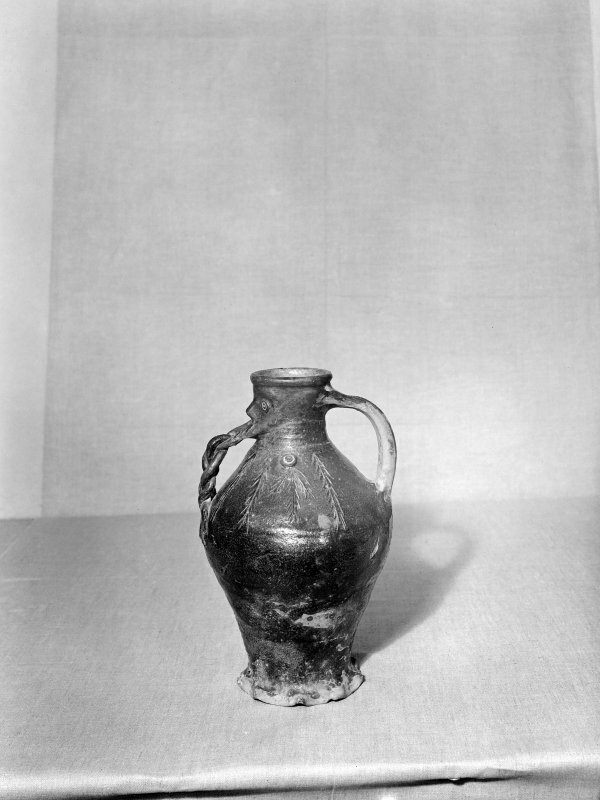 A pottery jug: from the side. 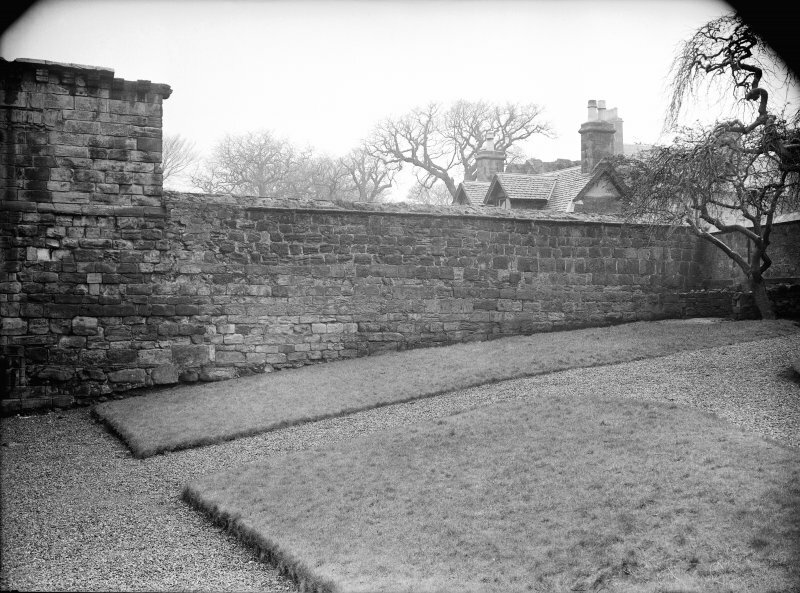 Repaired section of encroaching wall. 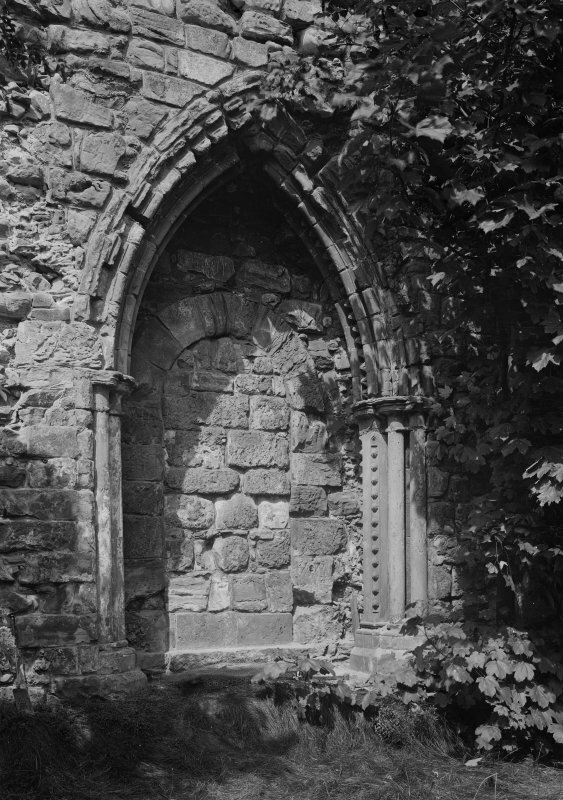 Blocked up Archway with inner semicircular form. 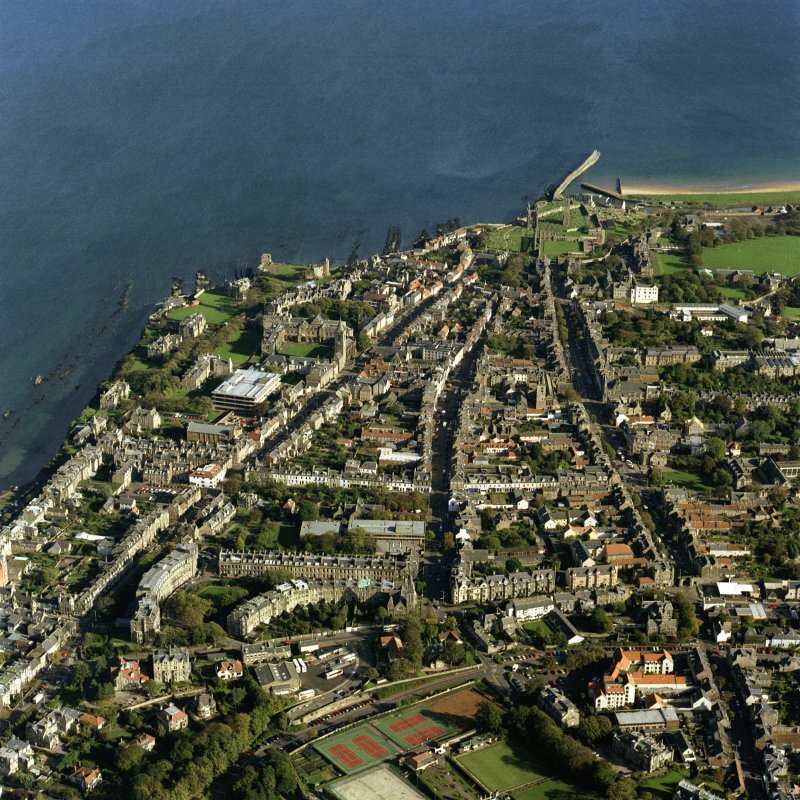 St Andrews, oblique aerial view. 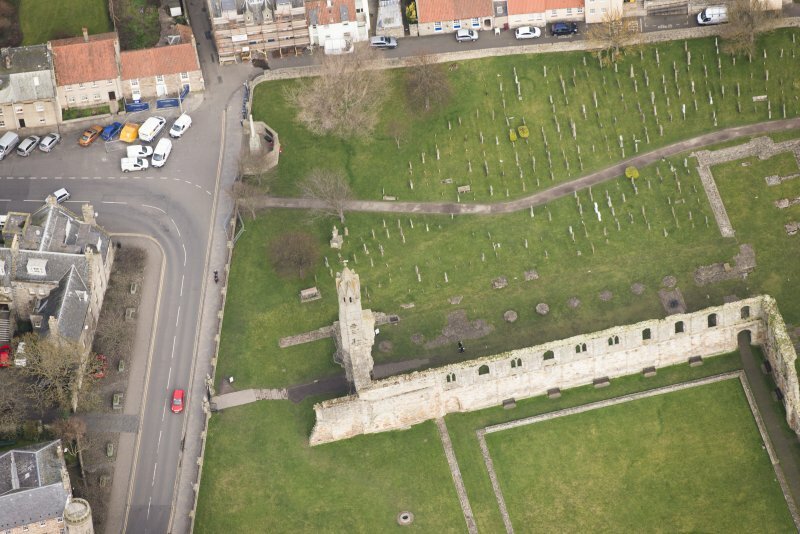 Oblique aerial view of the remains of the cathedral and burial ground, taken from the ESE. 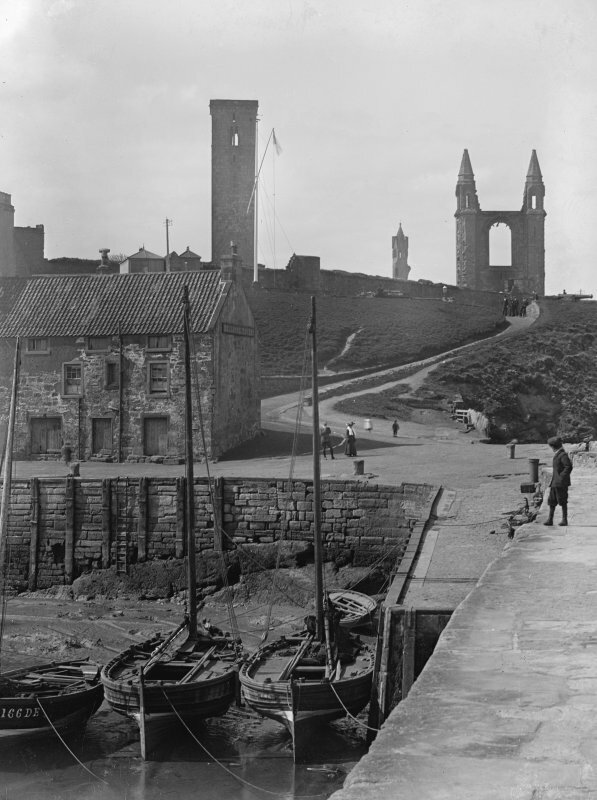 View from East of pier, Bell Rock Tavern and in background St Andrews Cathedral. 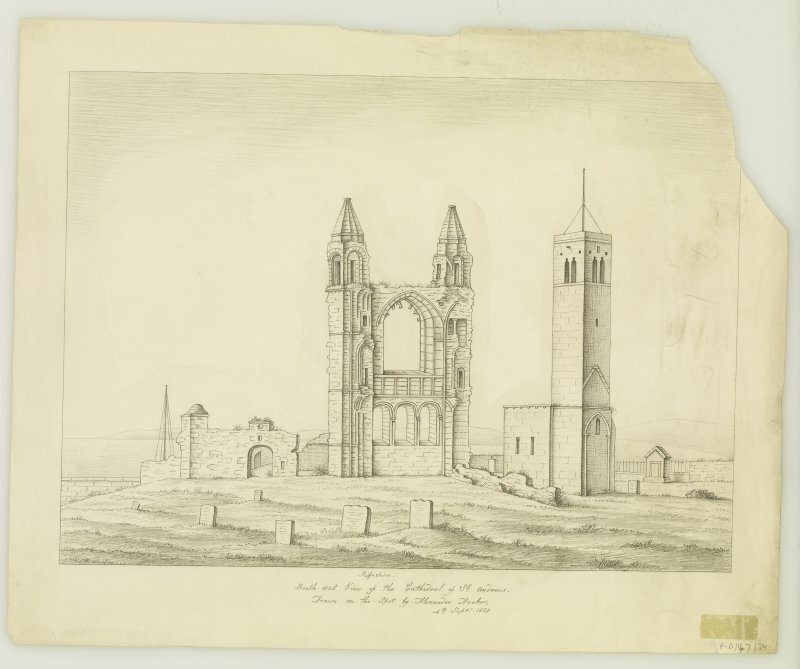 West front: plan, elevation and section of South half, St Andrews Cathedral. Insc. 'R. 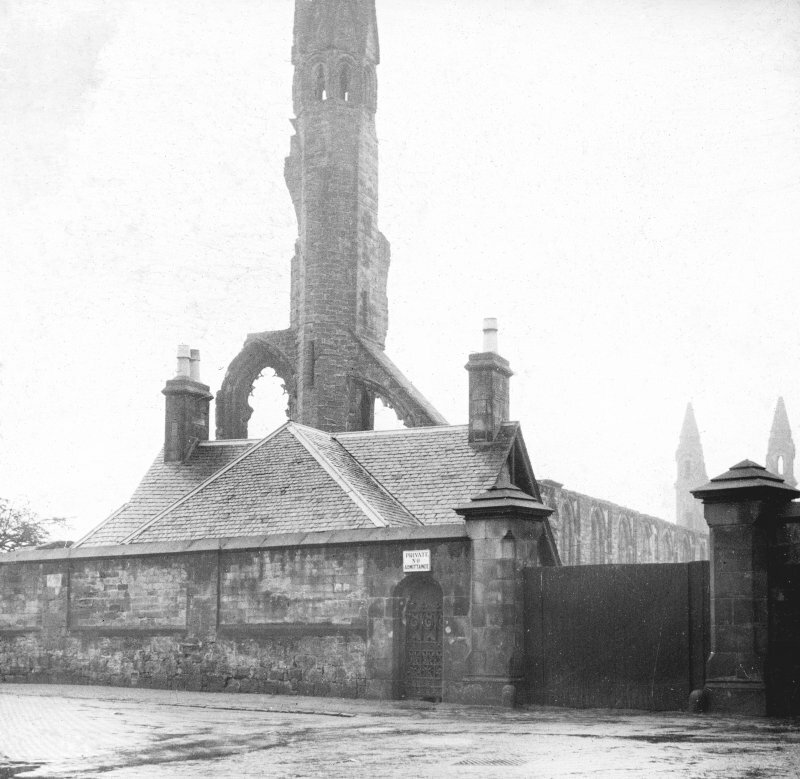 Campbell, May 1901'. 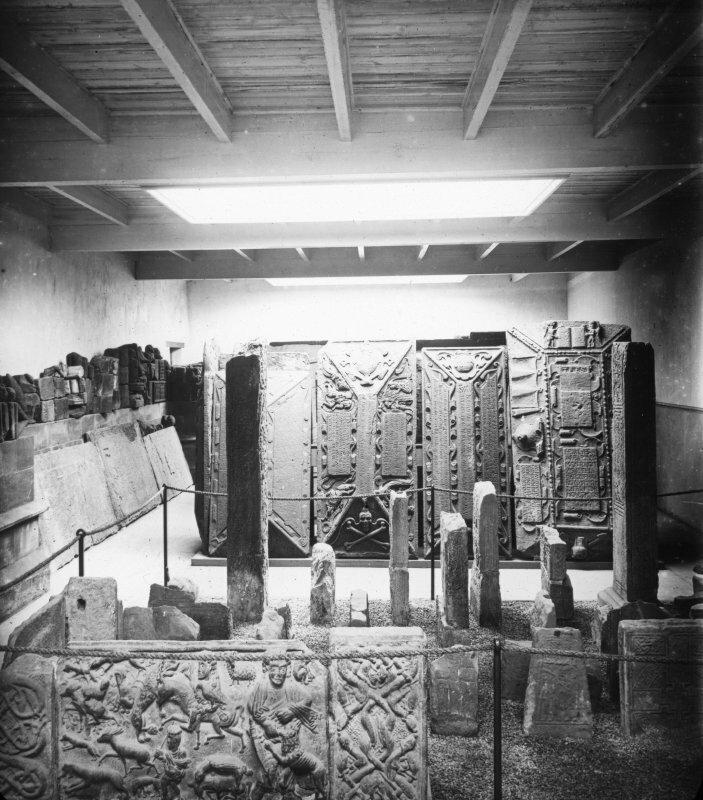 View of interior showing sarcophagus. 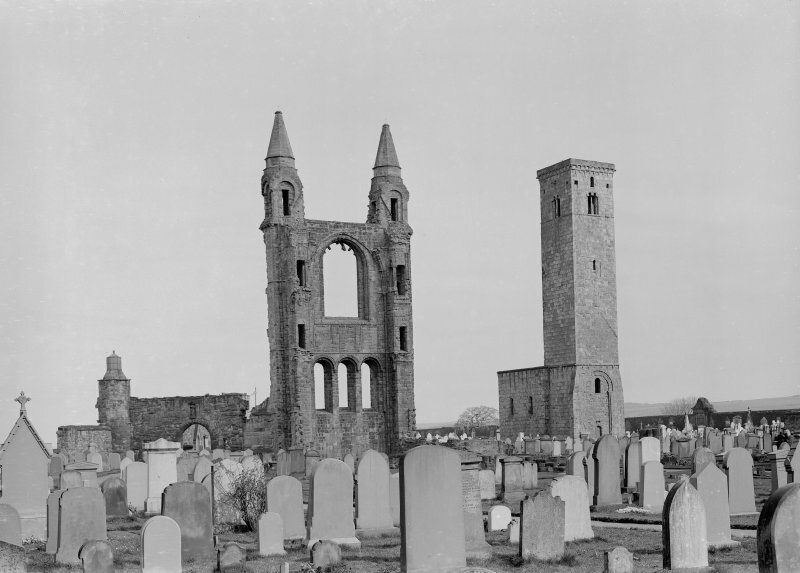 General view of St Andrews Cathedral and St Regulus Tower. 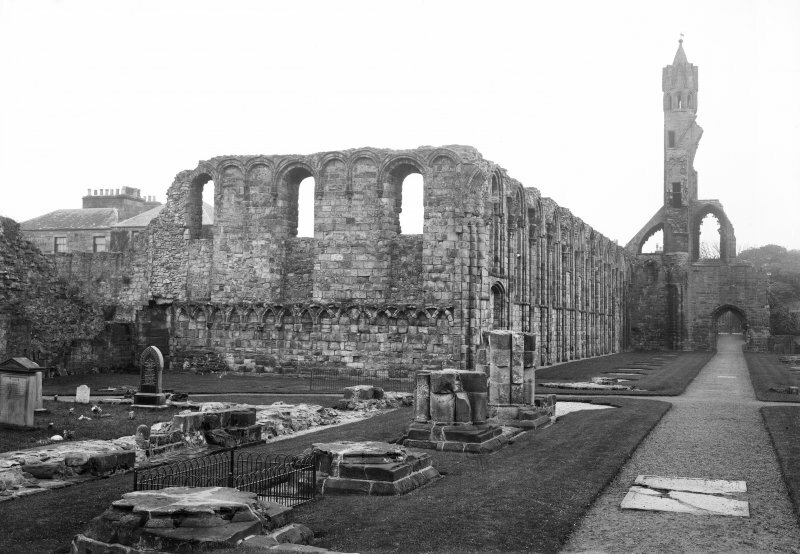 Details of south east respond in south aisle of nave and arcade in west wall of south transept, St Andrews Cathedral. 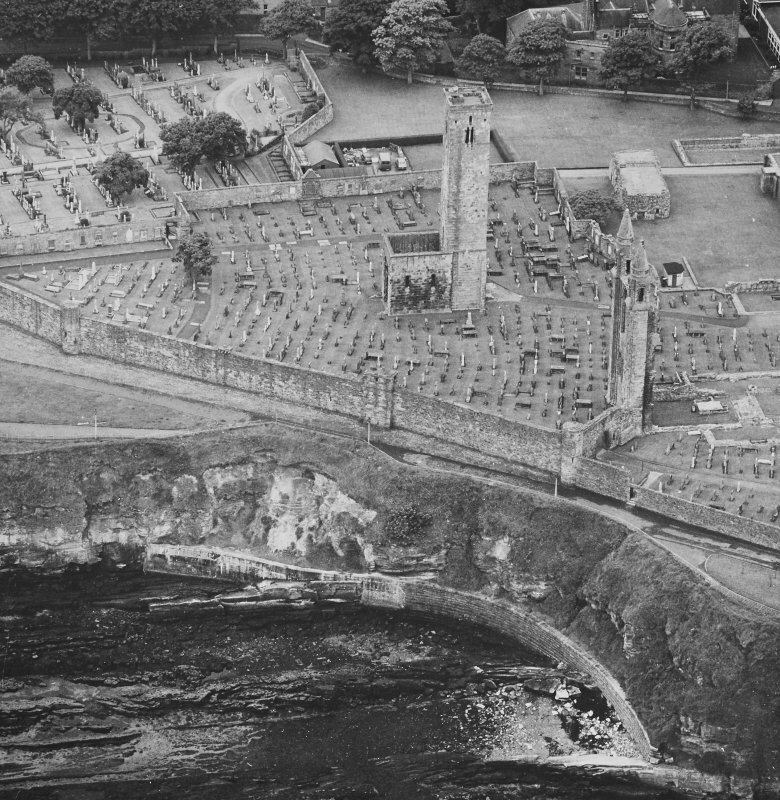 Oblique aerial view of the remains of St Andrews Cathedral and burial-ground with the gas works adjacent, taken from the E.
West front, south wall showing cut off arcade. 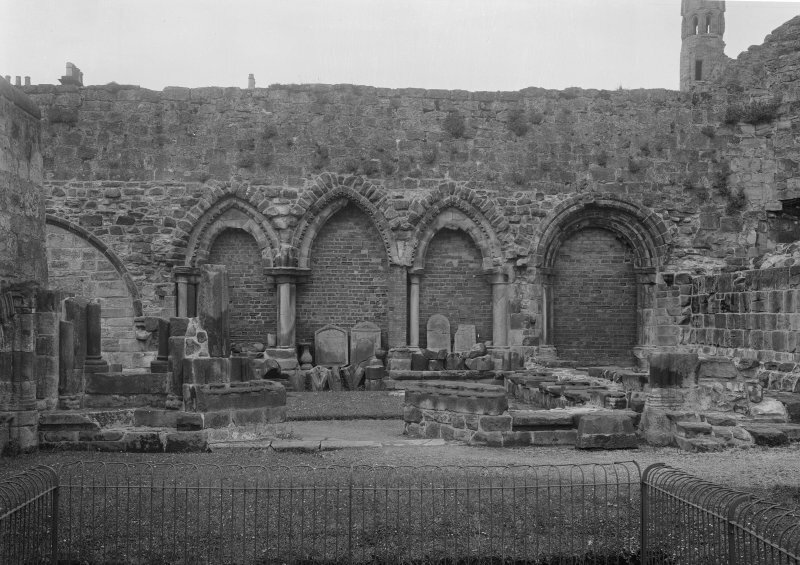 South transept & aisle looking to west turret. 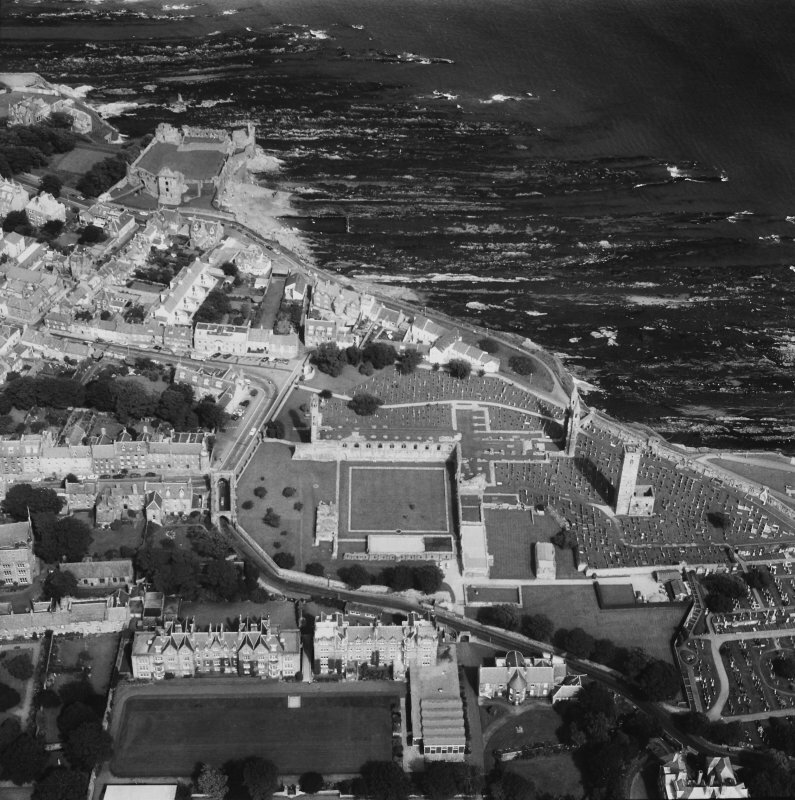 Oblique aerial view of St Andrews centred on the remains of the cathedral and burial-ground, taken from the WSW. View from West. Taken from 'The Life of David Roberts by James Ballantine MDCCCLXVI'. 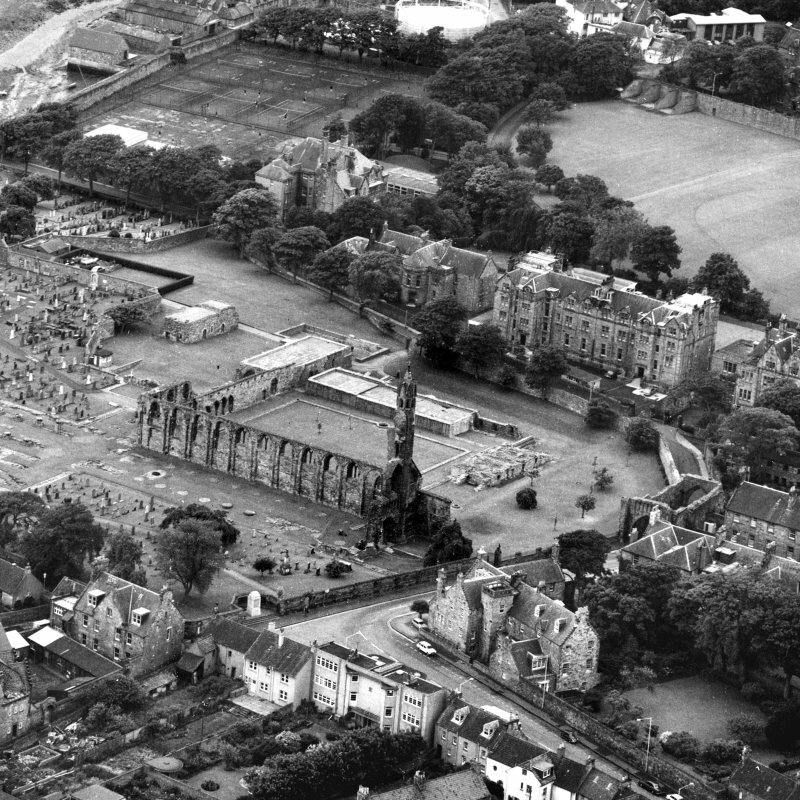 Oblique aerial view including Cathedral from North. 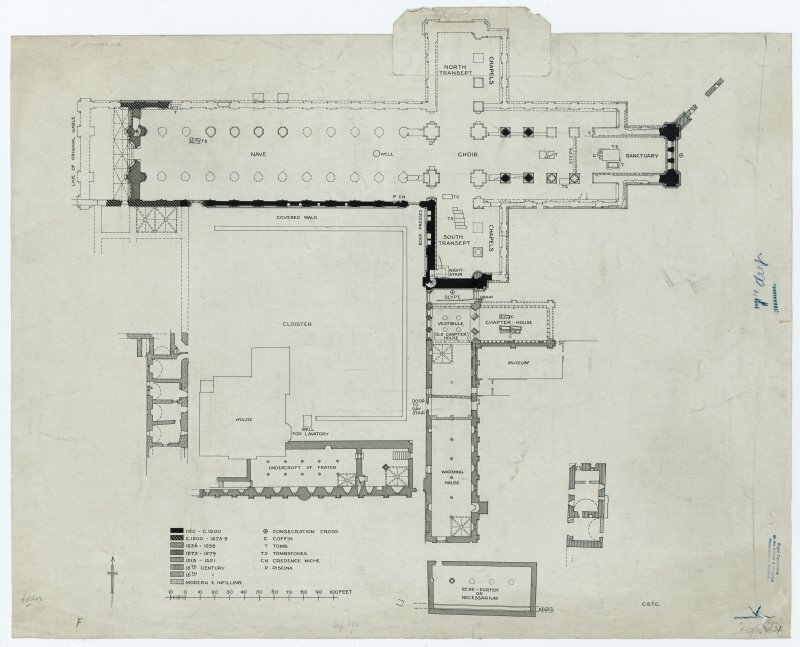 Photograph of drawing showing plan of building periods of Cathedral and Priory. 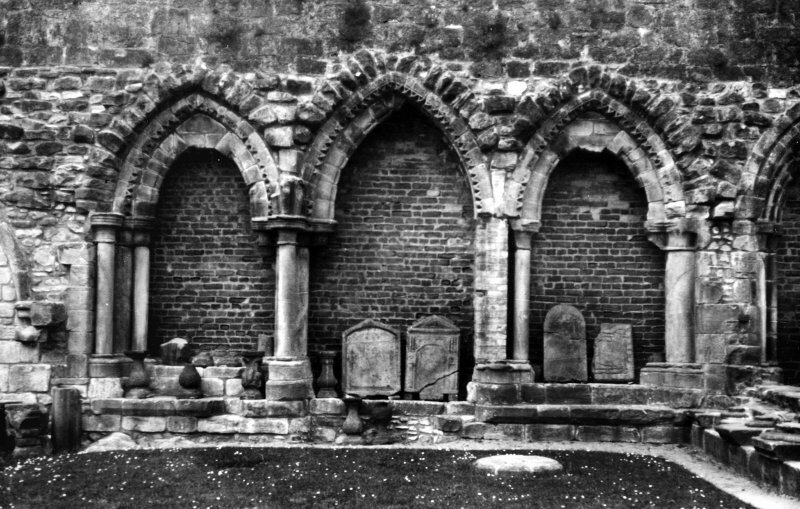 Details of entrance to New Chapter House showing bosses, jambs and bases, St Andrews Cathedral. 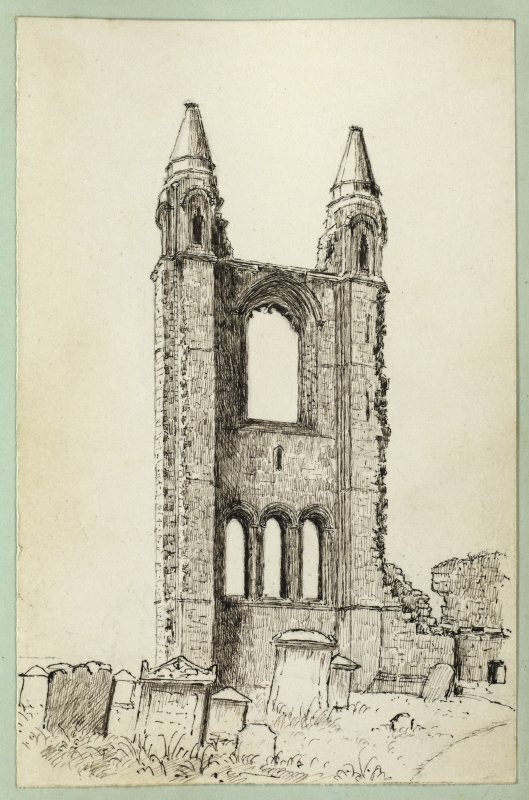 Sketch of St Andrews Cathedral. 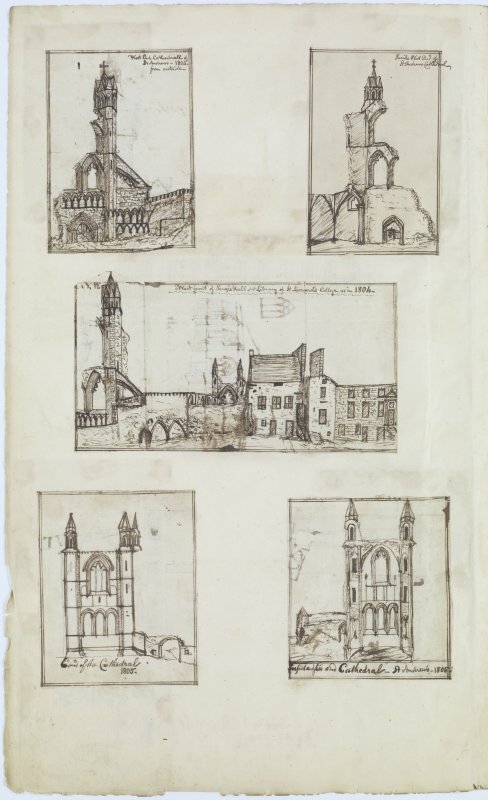 Sketches of St Andrews Cathedral and St Regulas tower. 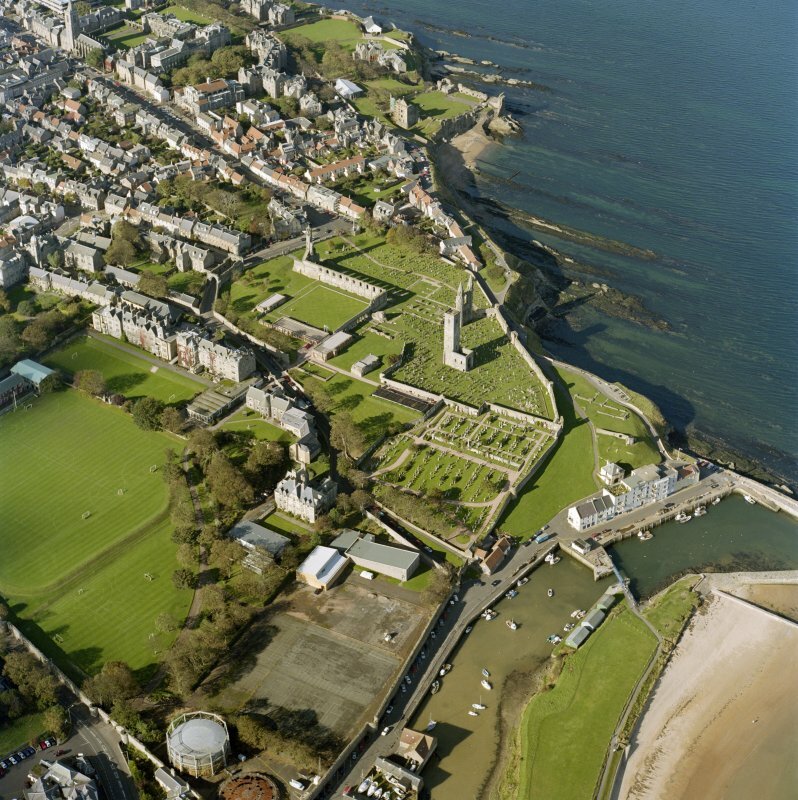 View of St Andrews from St Rule's Tower. 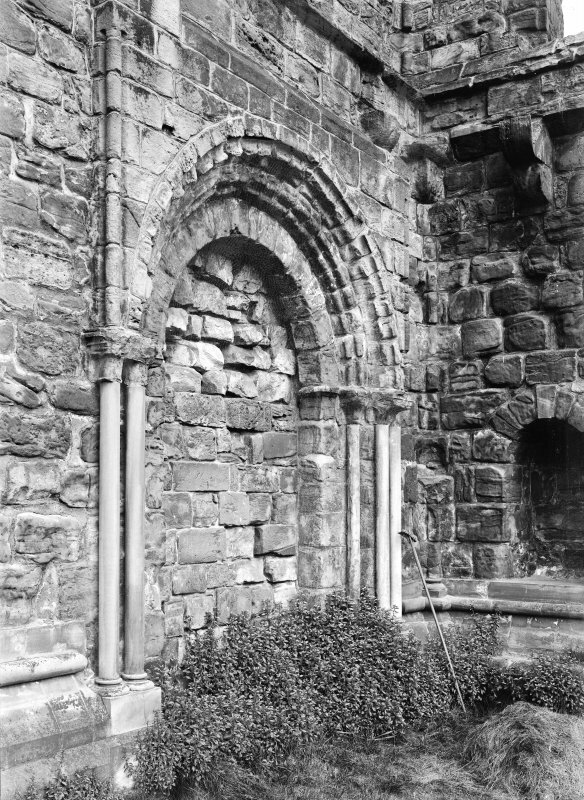 Blocked semi-circular Archway entrance to Chapter House. View from the N west taken from an old print. Rere-Dorter or Necessarium from the East. 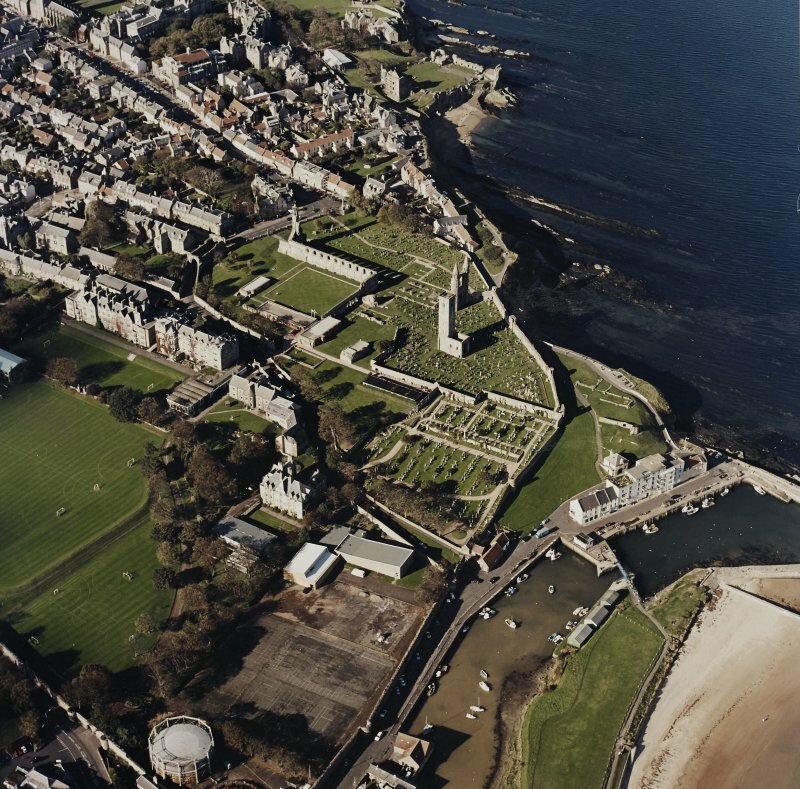 Oblique aerial view centred on the remains of St Andrews cathedral and burial-ground, taken from the SE. 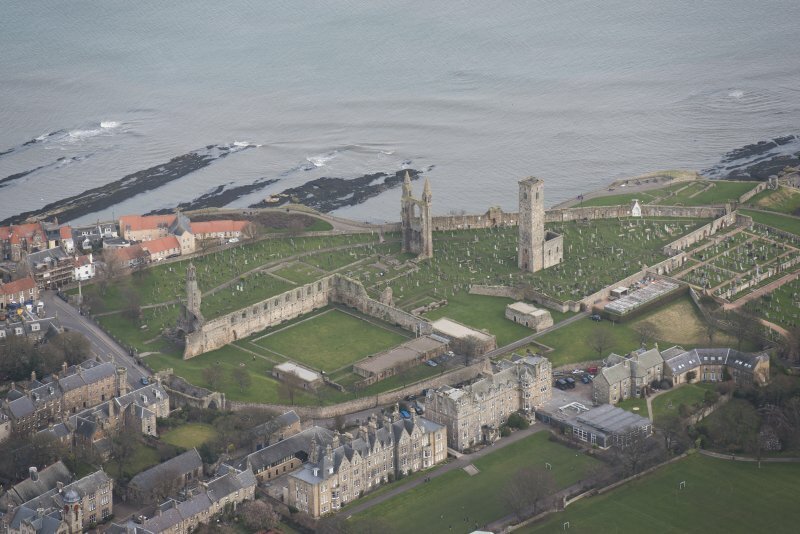 St Andrews Cathedral. 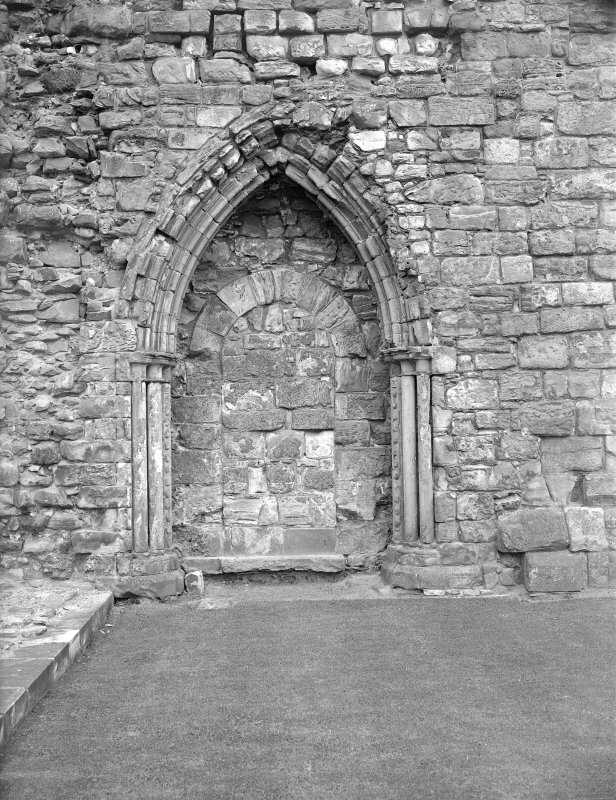 View through West Entrance, from West. 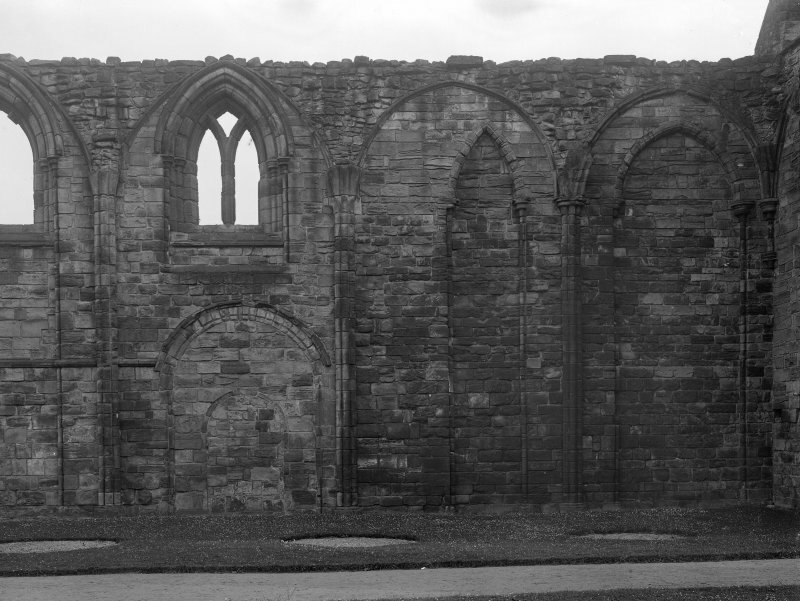 View of West gable from West. 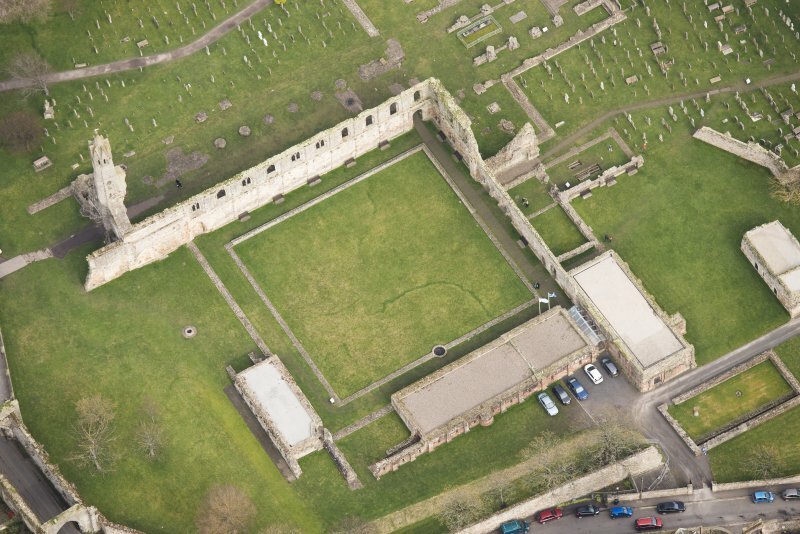 Oblique aerial view of the remains of the cathedral and burial-ground with the gas works adjacent, taken from the SSE. 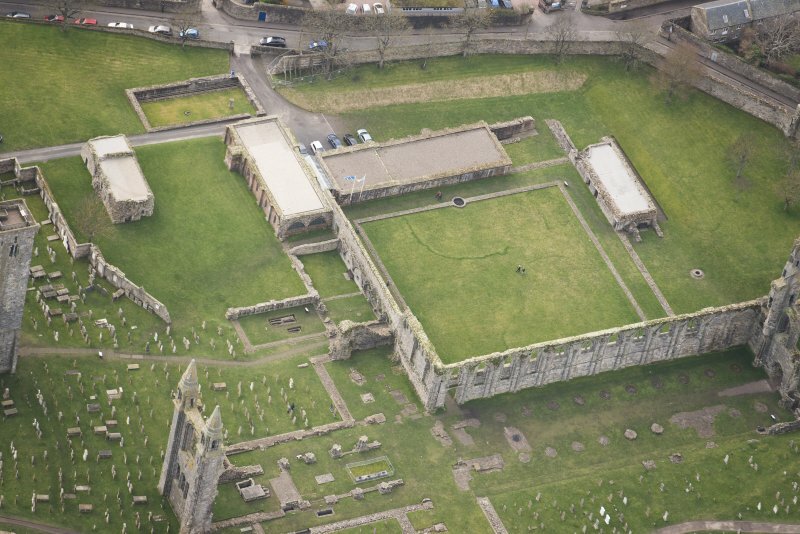 Oblique aerial view centred on the remains of the cathedral and burial-ground, taken from the NW. 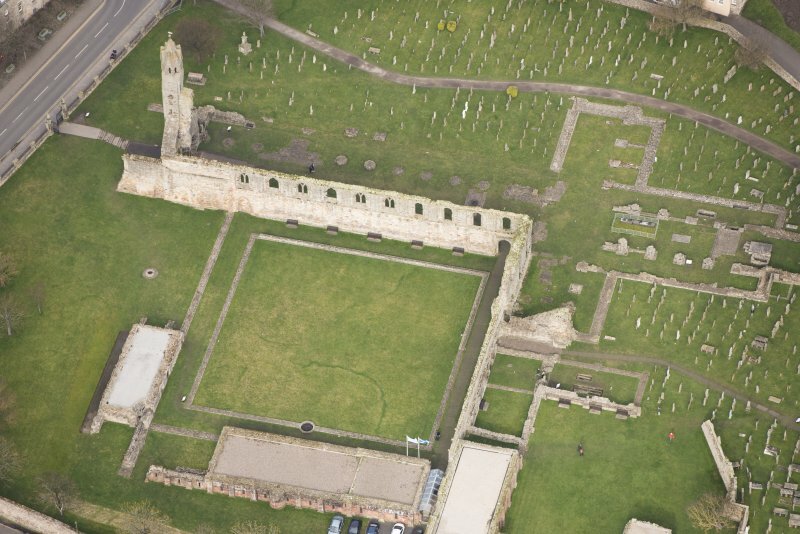 Oblique aerial view centred on the remains of the cathedral and burial-ground, taken from the SE. For description and history, see MoW Official Guide. 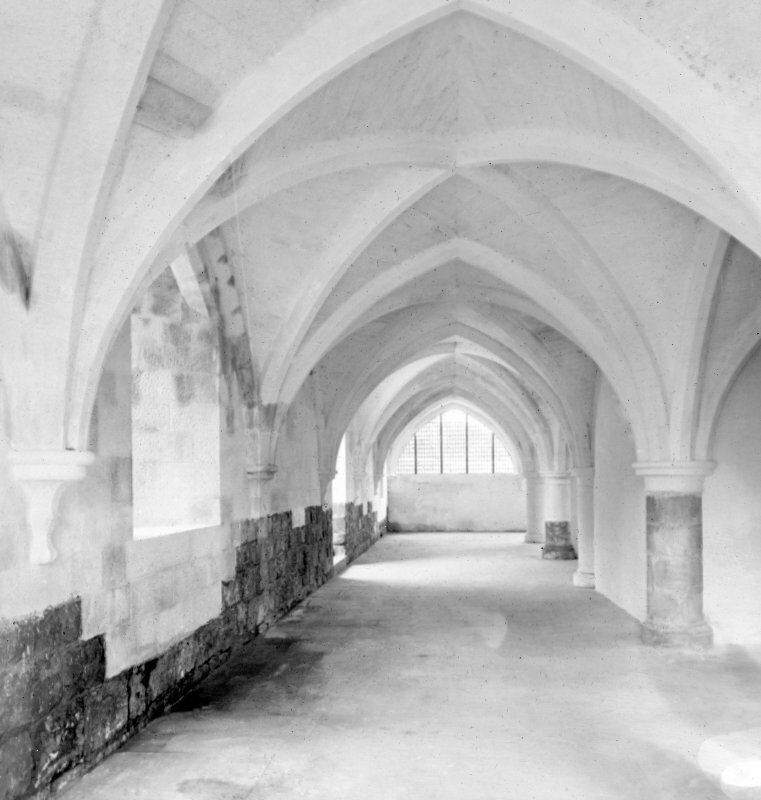 The problem of stagnant water in the cellar of the monastic S range prompted the examination of drainage in the adjacent cloister alley. 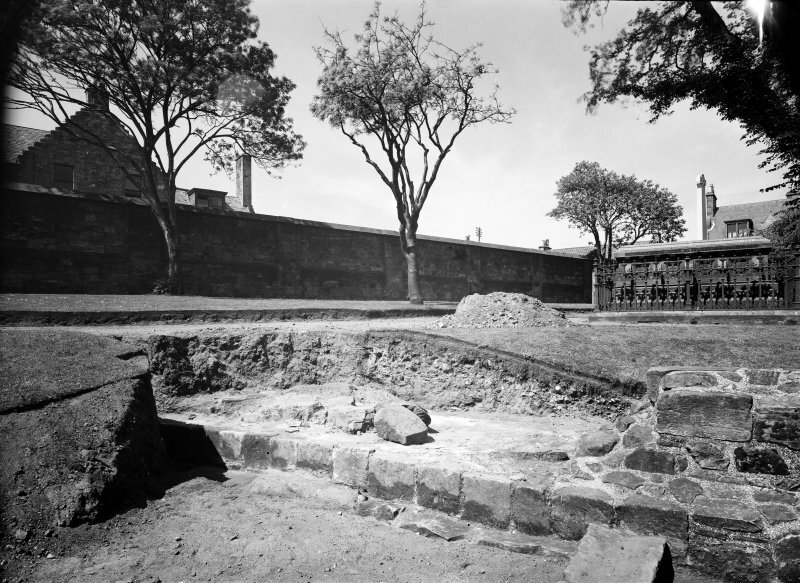 Within the excavated areas no evidence of medieval occupation had survived the attentions of previous, similarly intentioned investigators. NO 5145 1659 Minor archaeological excavations were undertaken in July 2004 comprising four trial trenches across the line of an intended trench for a waste water pipe. 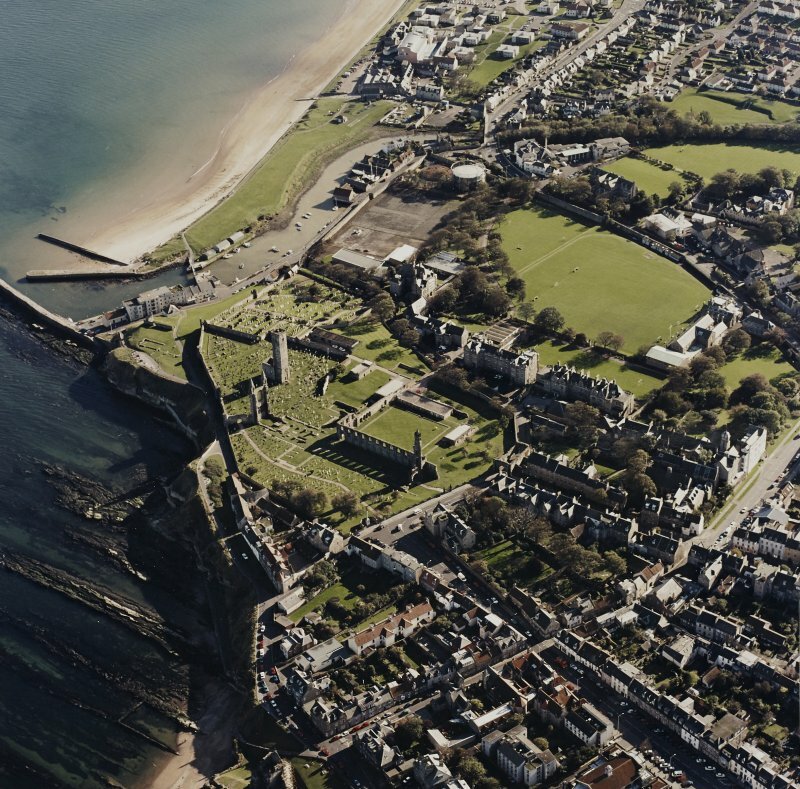 The archaeological potential of this area of the monument is affected by the extensive clearance and landscaping of the cathedral and graveyards from the Victorian period onwards. 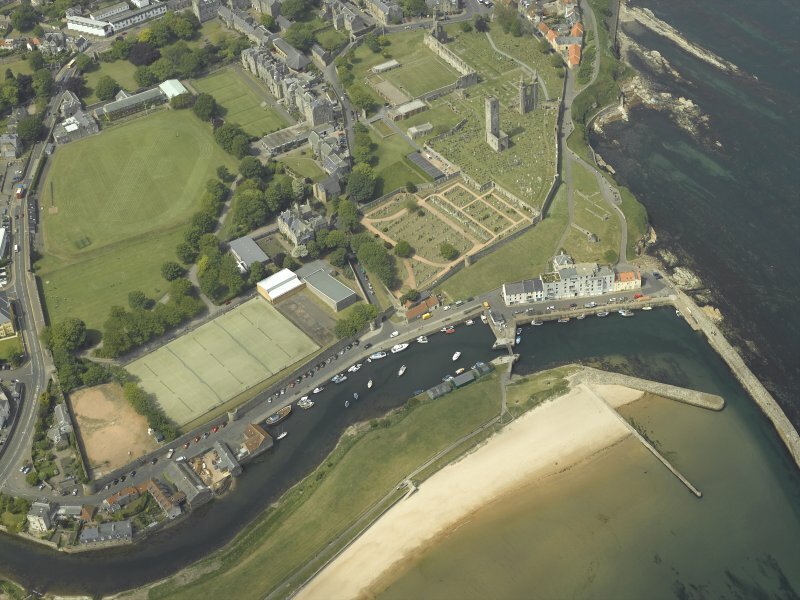 NS 5138 1663 A watching brief was undertaken in May 2005 during the excavation of a cable trench along the W and S walks of St Andrews Cathedral cloister, with 42m of trench in the S walk and 15m in the W walk, and a maximum depth of 0.5m. 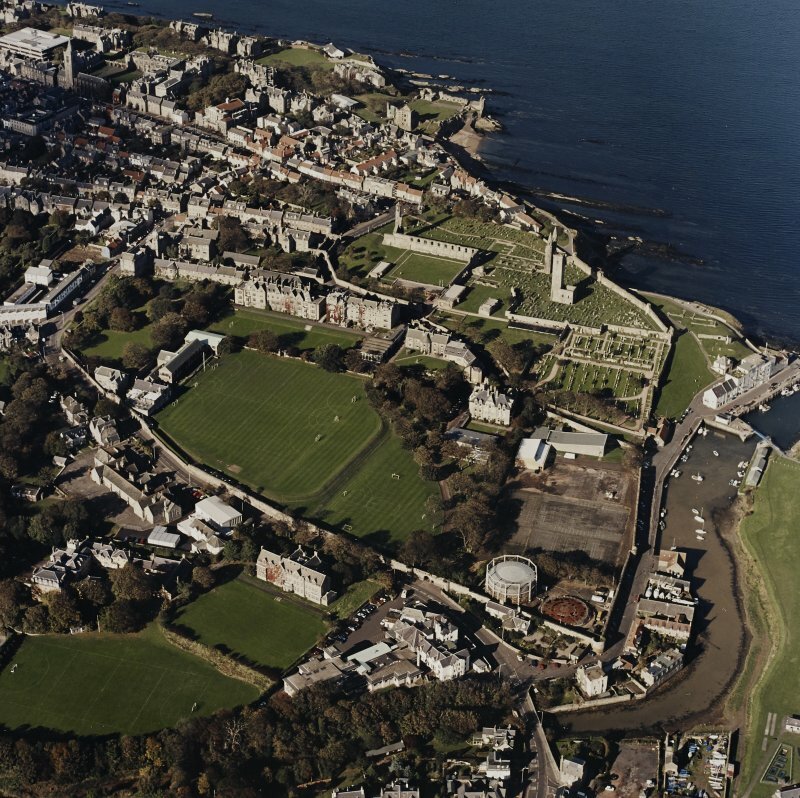 This area has been subjected to improvements during the 18th and 19th centuries resulting in new surface levels. 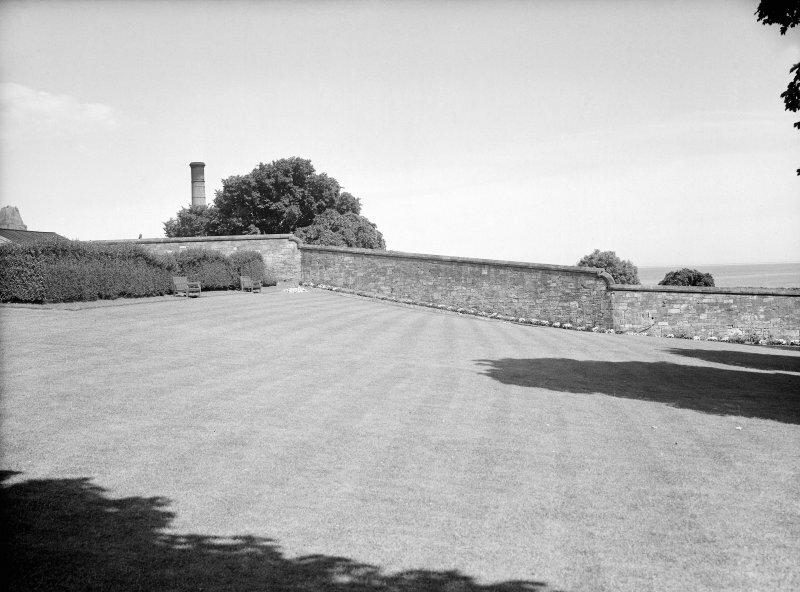 The old paved surfaces of the walkways had long been removed, with later 18th century levelling material added. 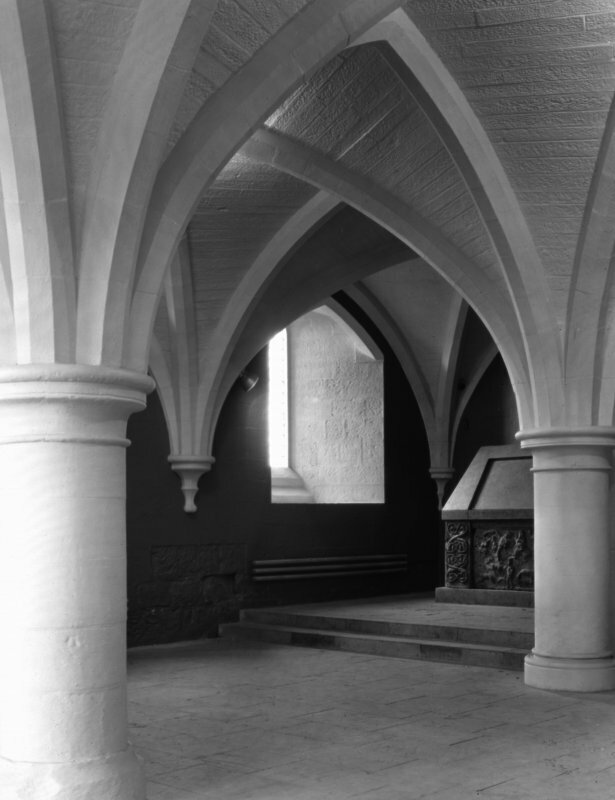 Works in the 19th century to the S undercroft had greatly disturbed the walkway bottoming deposits and 18th-century levelling, with 20th-century conduit work disturbing both 18th- and 19th-century works. These excavations were not deep enough to penetrate late disturbances. NO 5141 1668 A watching brief was undertaken in August 2006 during the removal of four stone bollards and excavation of foundations for six new cast iron bollards. 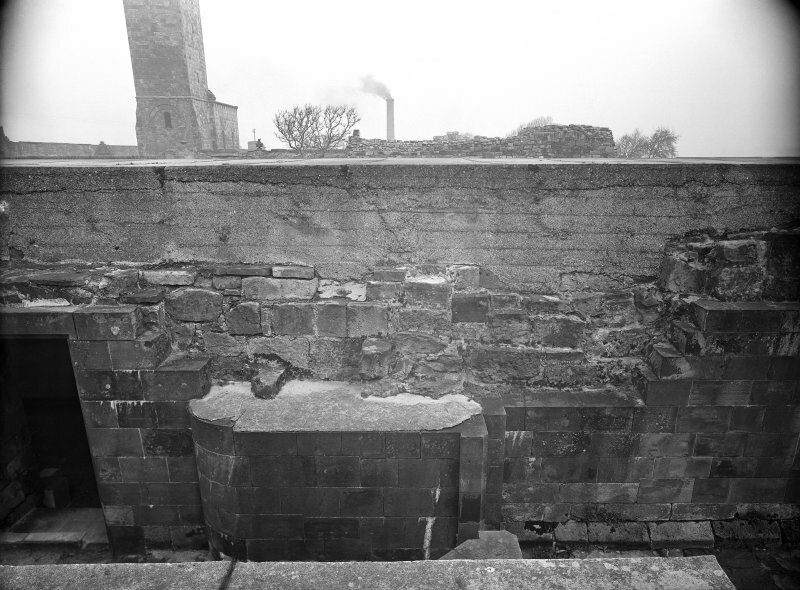 The removal of the stone bollards partially revealed possible flagged surfaces and the footings of the stone columns of the West Precinct wall. The works caused no disturbance to these features. 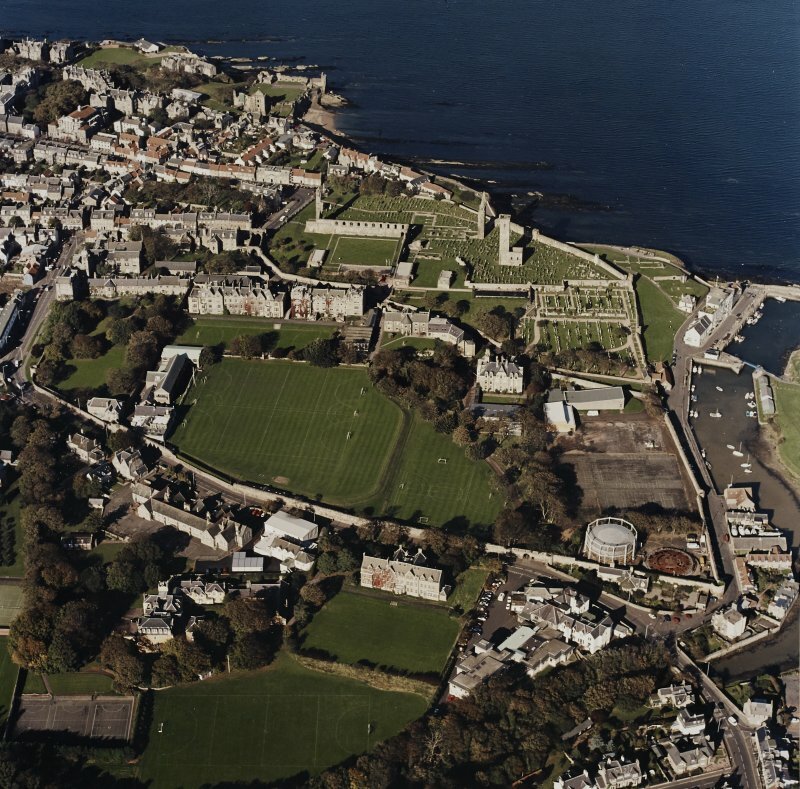 There were no other features of archaeological significance and no finds were retained. 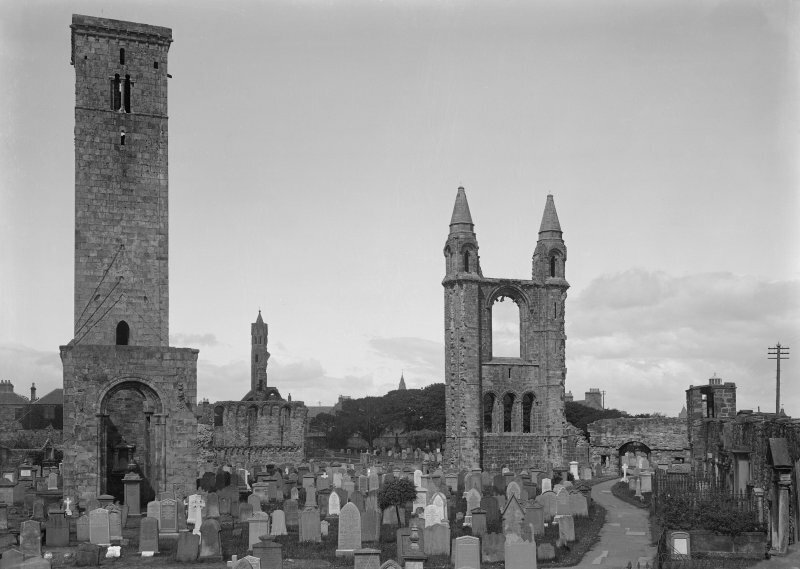 St Andrews Cathedral. Order of barons of exchequer authorising repairs to'steeple' to be carried out under direction of Principal Hill. 1. 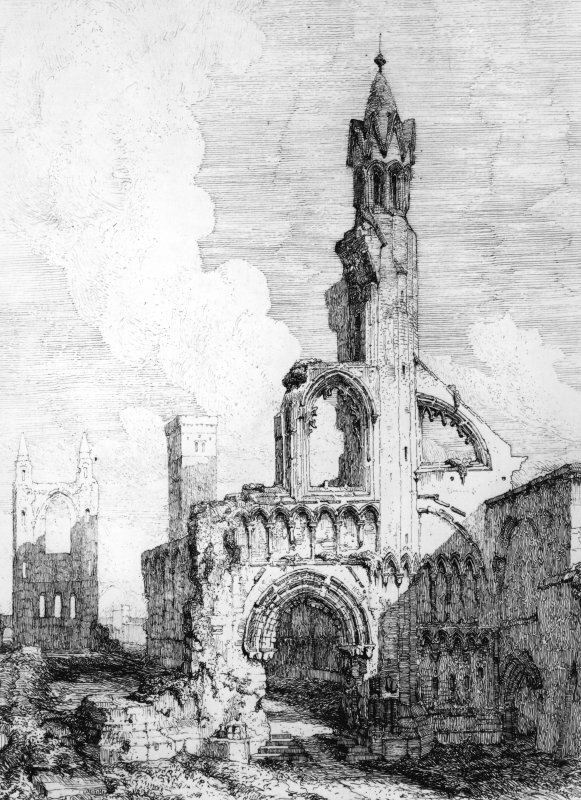 Letter from Robert Reid reporting on inspection of cathedral and castle and repairs needed at cathedral, 2 July 1825. 5. 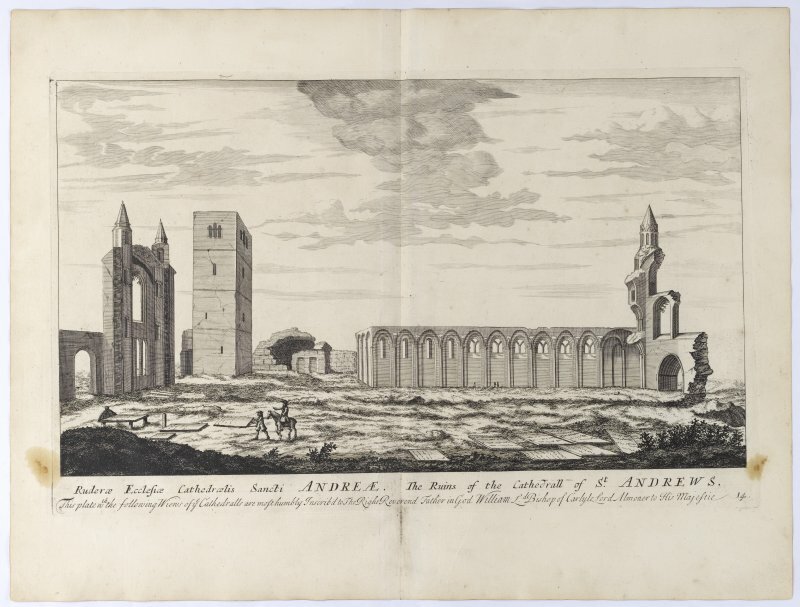 Letter from Reid on work at cathedral and additional work needed at castle; with report thereon, 19-23 Sept. 1823. 8. 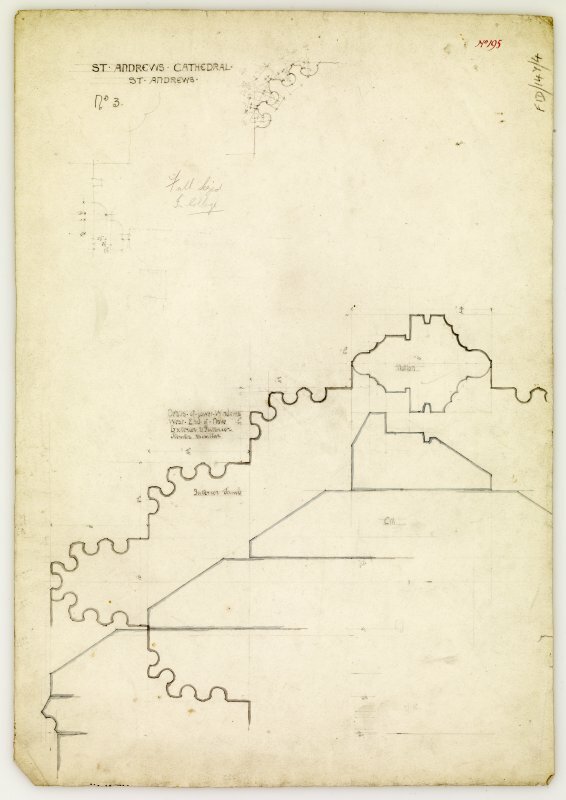 Account of John Kennedy, mason, for work at cathedral and castle, June 1826 - april . 9. 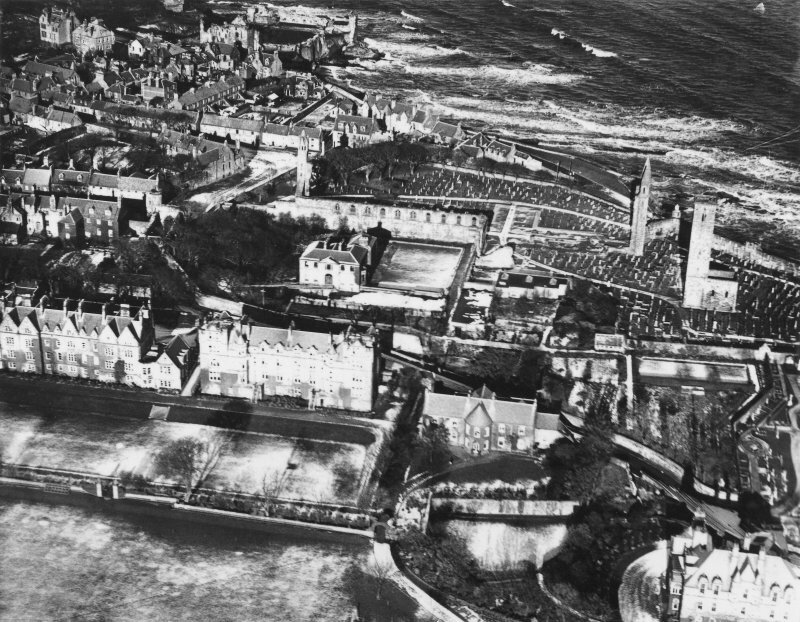 Letter from Professor Robert Haldane, St Andrews, on damage to sea wall at 'Dennis Wharf', 22 Nov. 1827. 10. Letter from Reid concerning sea wall and Kennedy's account, 15 Dec. 1827. 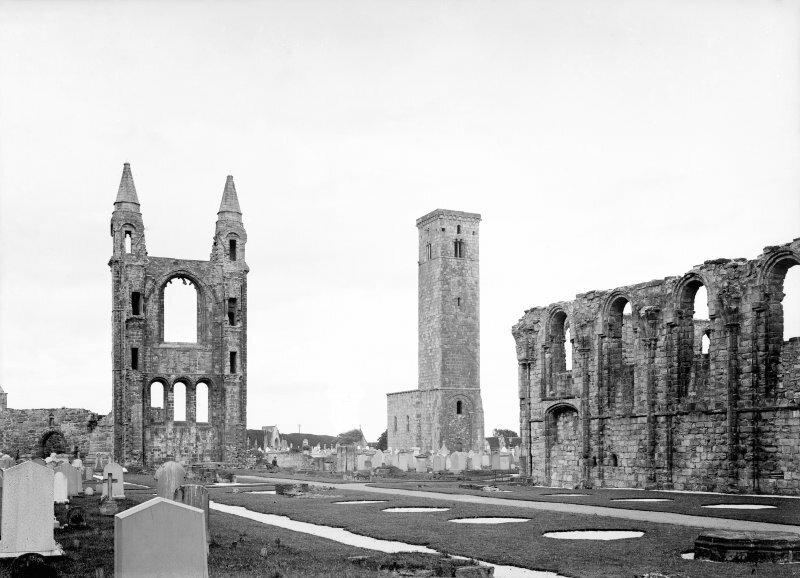 The Cathedral church and priory of St. Andrews is a successor to the adjacent church of St. Regulus. 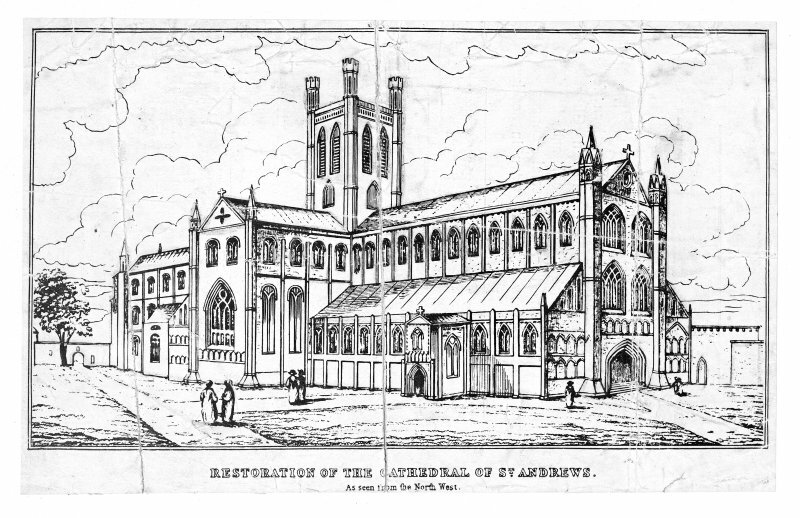 Bishop Robert's successor founded the cathedral church in 1160 x 1161. 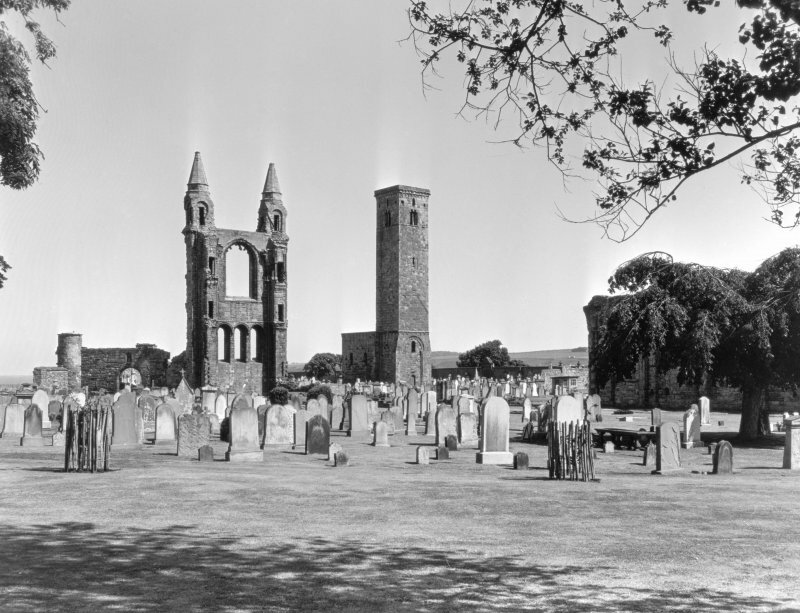 Although the choir was completed by 1238, the church itself was not consecrated until 1318. 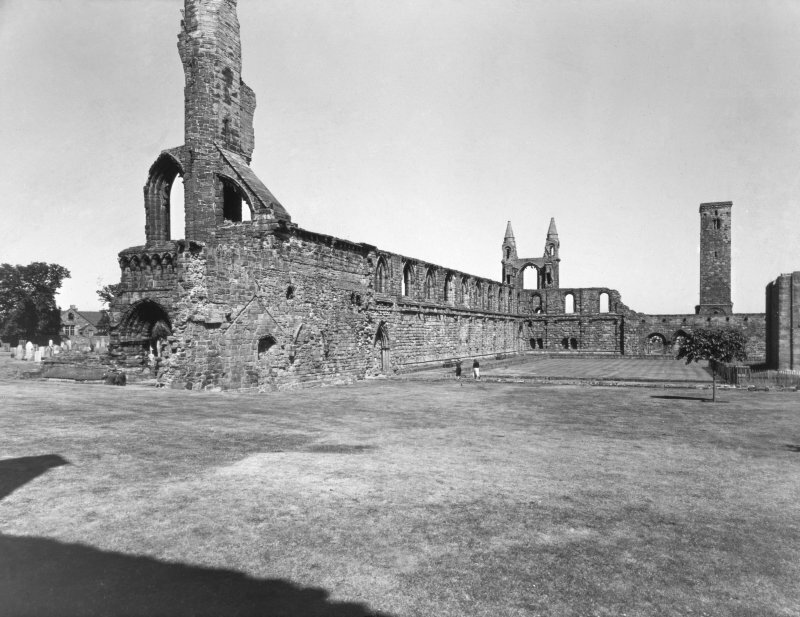 Before its consecration, storm damage ruined the west front and it was subsequently rebuilt by Bishop Wishart (1273 x 1279). 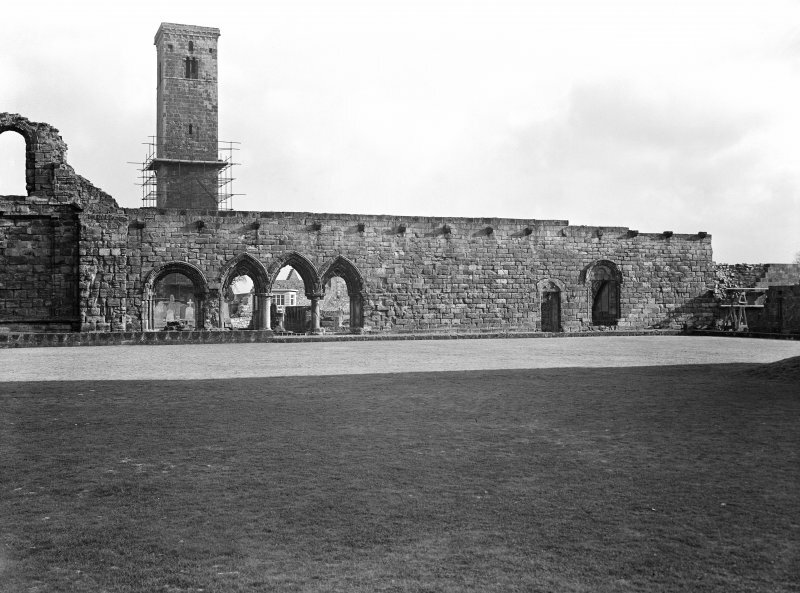 This reconstruction reduced the overall length of the nave by thirty four feet (10.36m) (RCAM, 1933, 231). 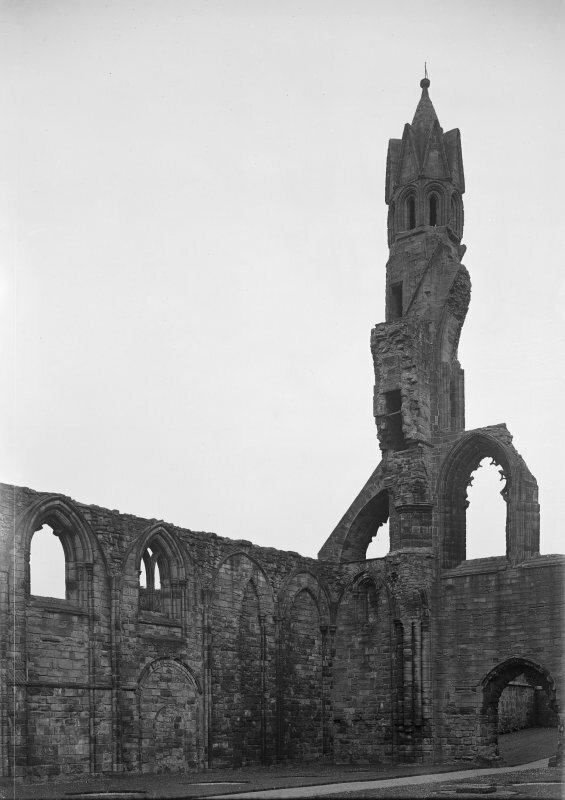 Fire caused havoc in the choir and transepts in the later fourteenth century, while storms badly lashed the building in the early fifteenth century. 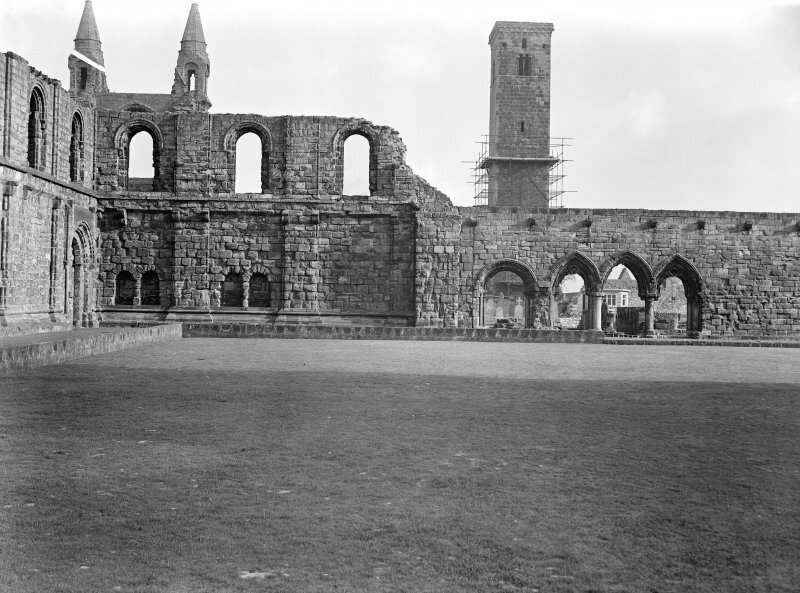 After the Reformation, the cathedral was allowed to decay, and even as late as the 1770s, as Dr. Johnson savagely observed, 'every man carried away the stones who fancied that he wanted them' (Baynes and Campbell, 1887, 144). 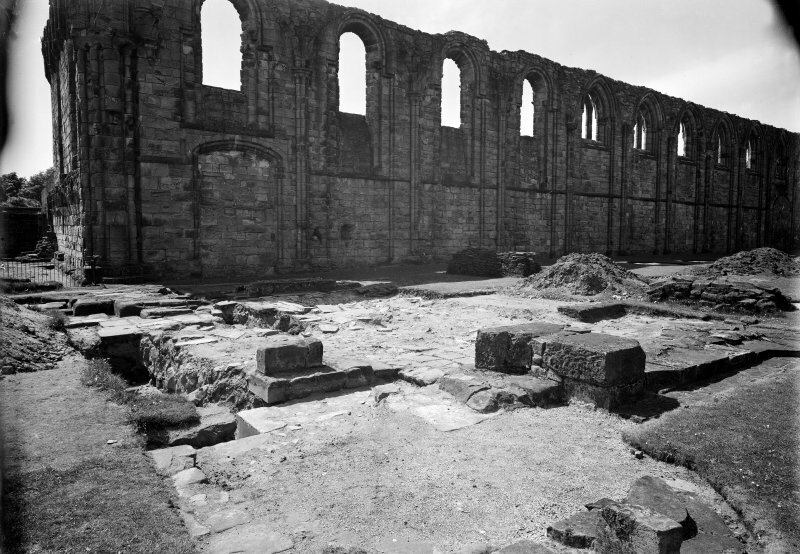 The remains of the church are very incomplete. 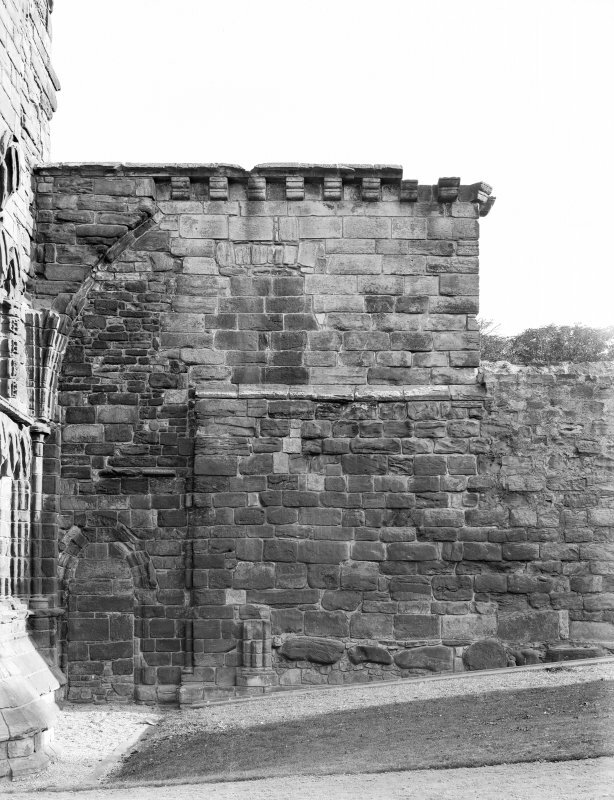 Although the east gable is nearly entire, less than half the west gable is complete. 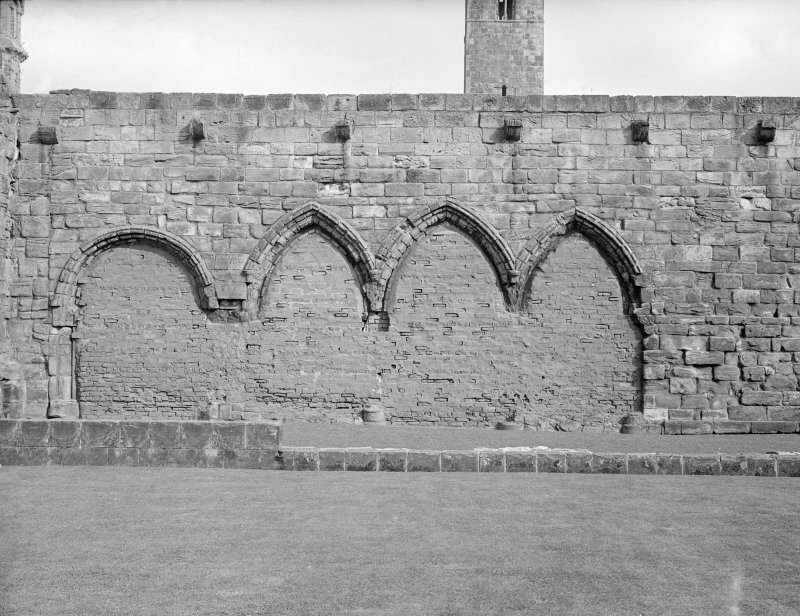 Of the choir, the north wall has been reduced to its foundations although some remains of the south wall are above ground. 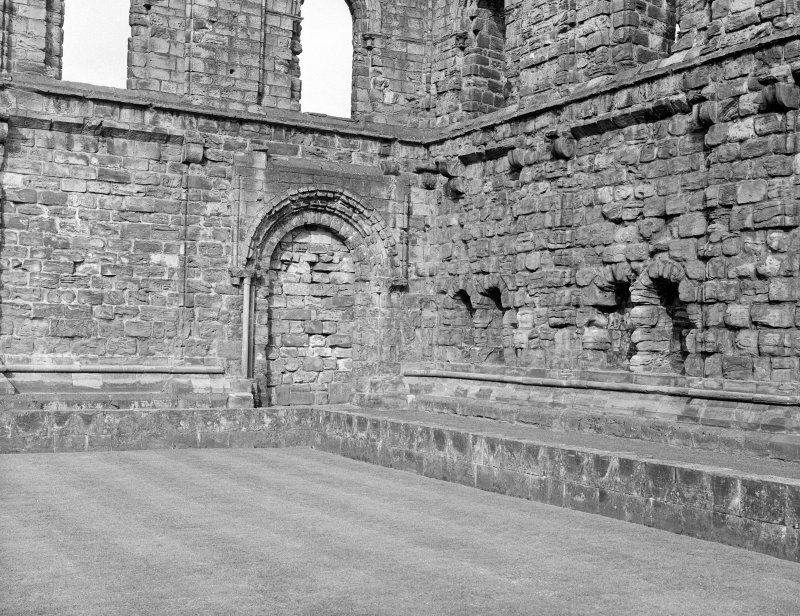 Little remains of the north side of the nave wall, although the South wall is nearly entire. 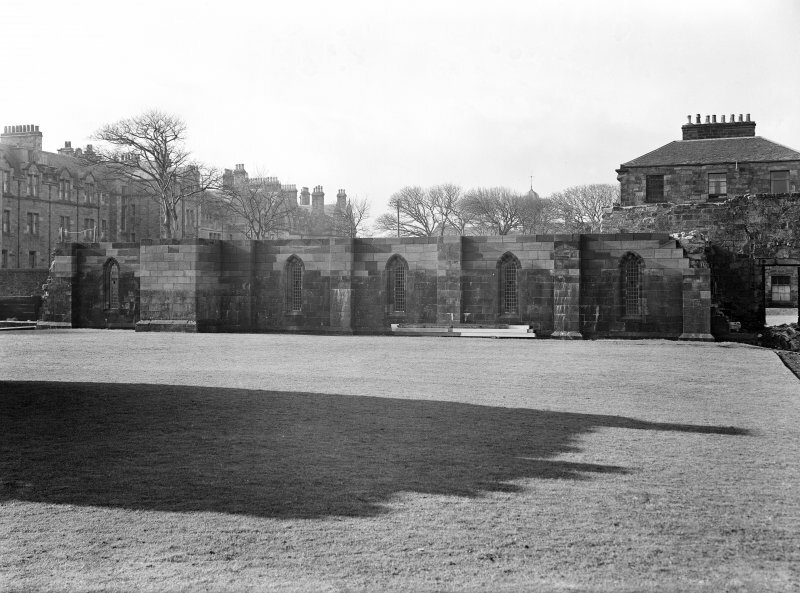 Excavation has uncovered the missing parts which are marked out clearly in the turf (RCAM, 1933, 231). 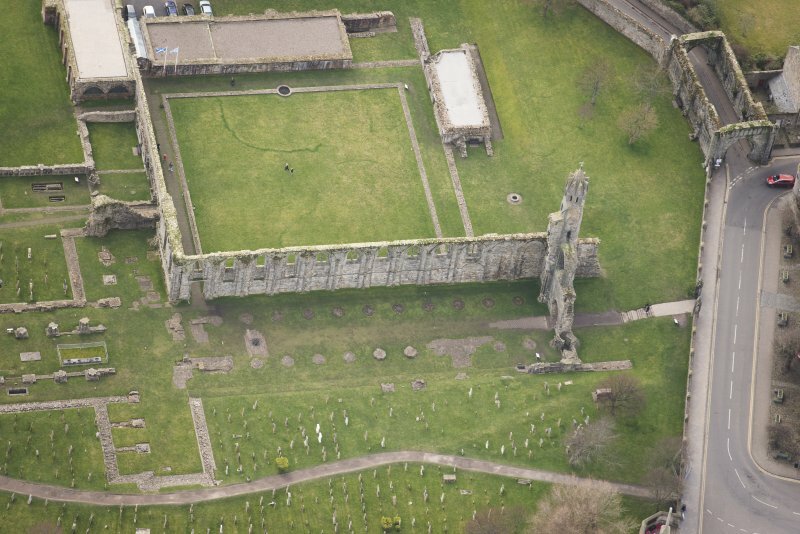 St Andrews Cathedral was an Augustinian foundation, the original community being brought to the Church ofS t Rule, St Andrews, about 1127. 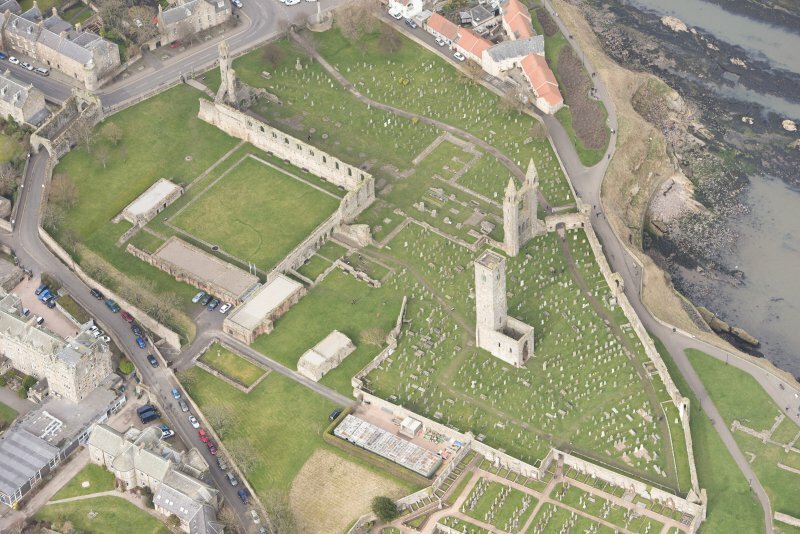 The building of the present cathedral began in 1160 on a site adjoining St Rule's Church. 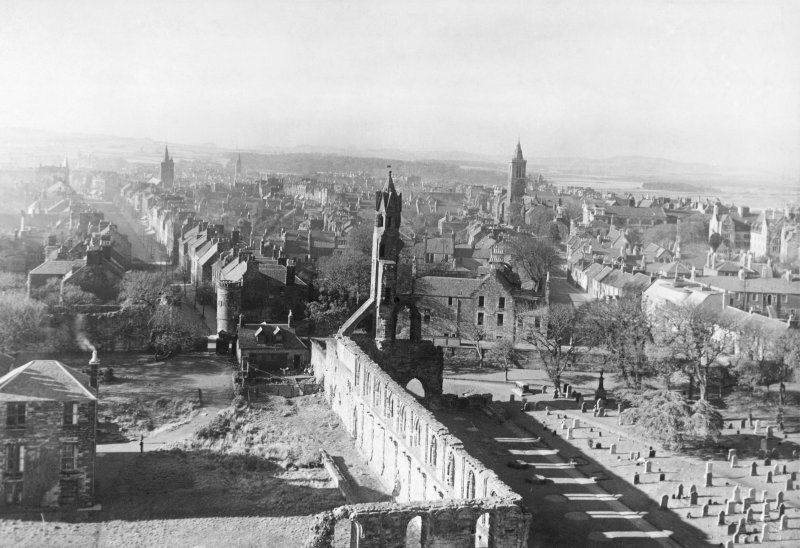 The cathedral church was set on a grand scale with an internal east·west dimension of over 109m. 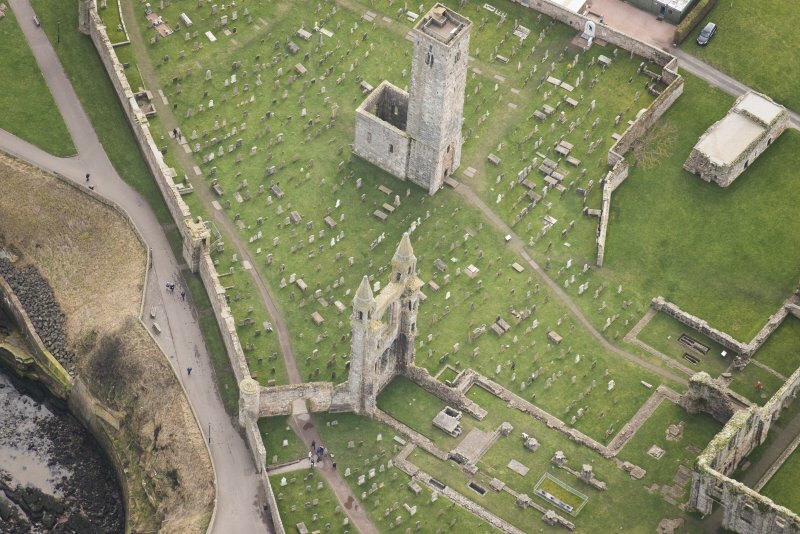 This makes it one of the longest churches ever built in Britain and by far the greatest church in Scotland. 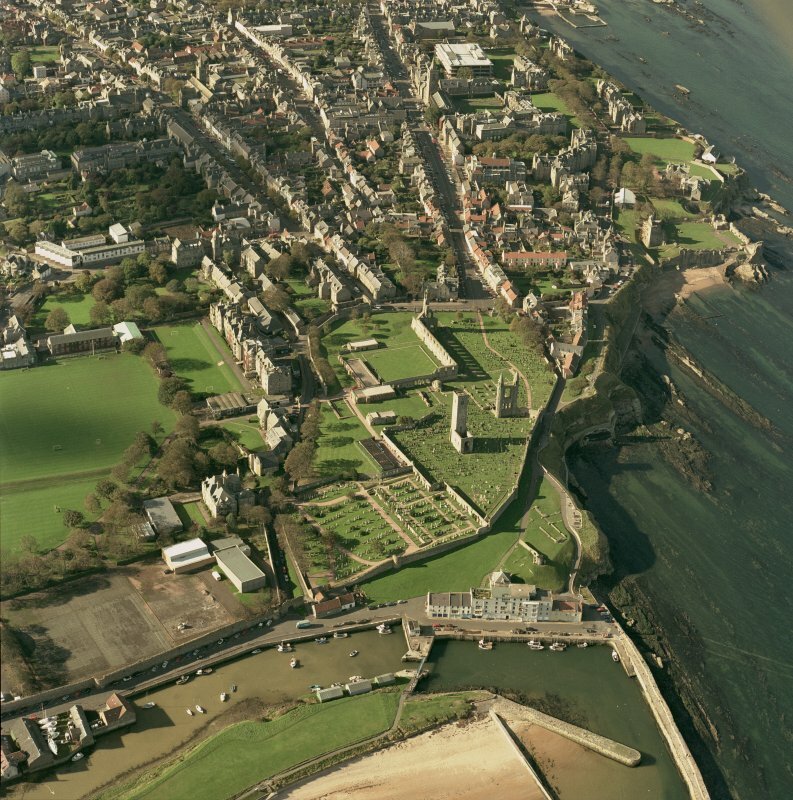 Unfortunately very little now survives apart from the ruined gables and parts of the south wall. 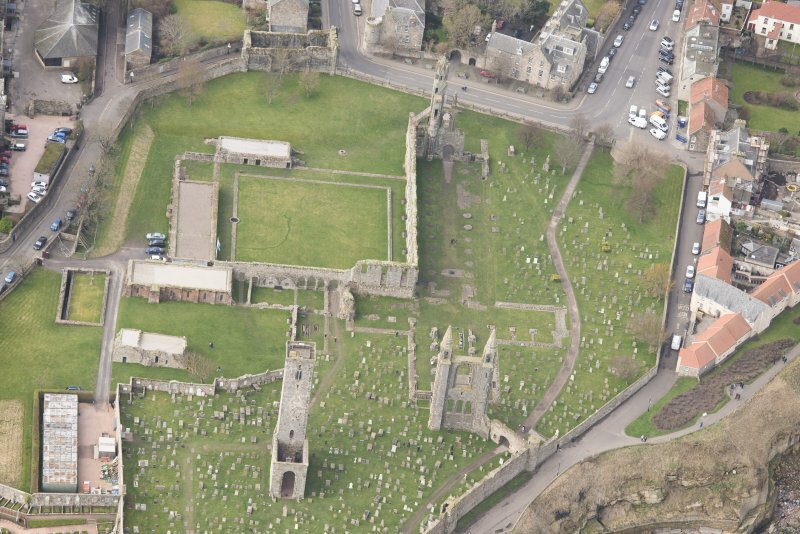 The monastic buildings to the south of the church are even more ruinous apart from a remarkably well preserved precinct wall; it encloses about 12.14 hectares and is 1.6km long, 6.1m high and 0.8m thick, fortifIed by a series of attached towers, some round and others rectangular. 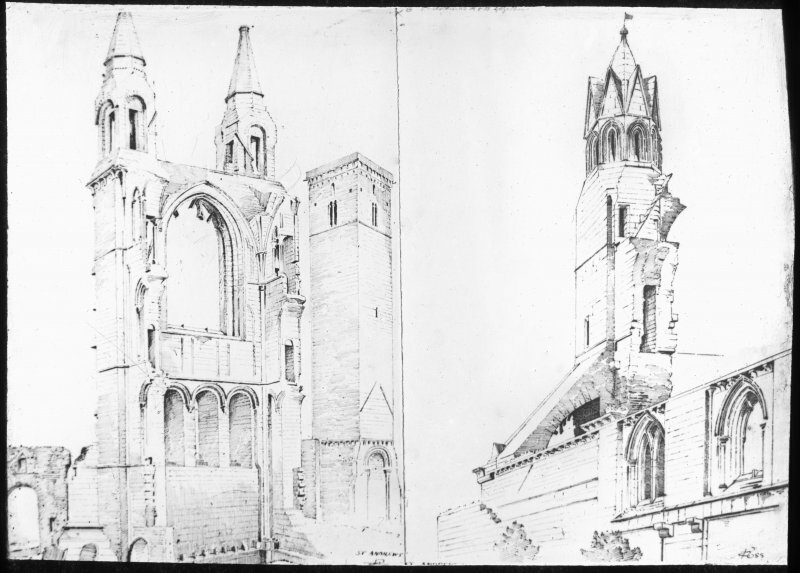 After the foundation of the cathedral and priory in 1160, building work followed the usual sequence, building in height from the east end towards the west front The choir was completed prior to 1238 when Bishop Malvoisine was buried there. 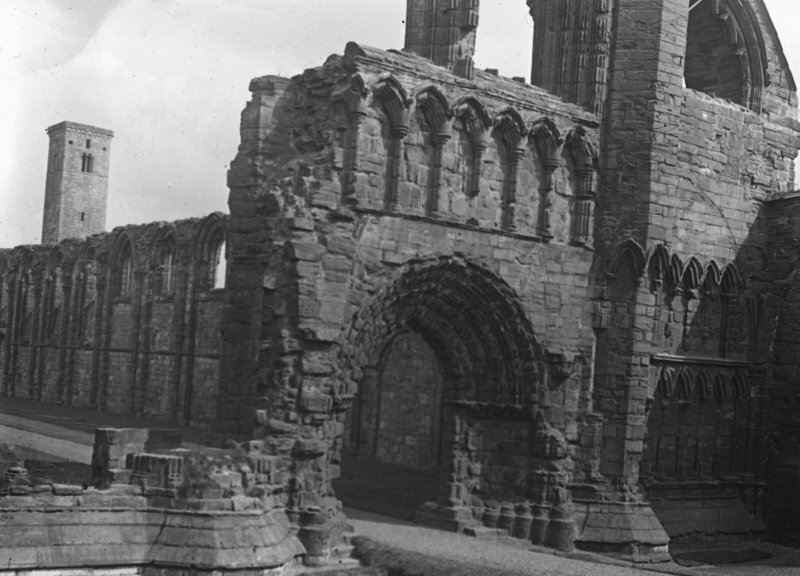 The great west front was destroyed in a storm and rebuilt between 1273 and 1279. 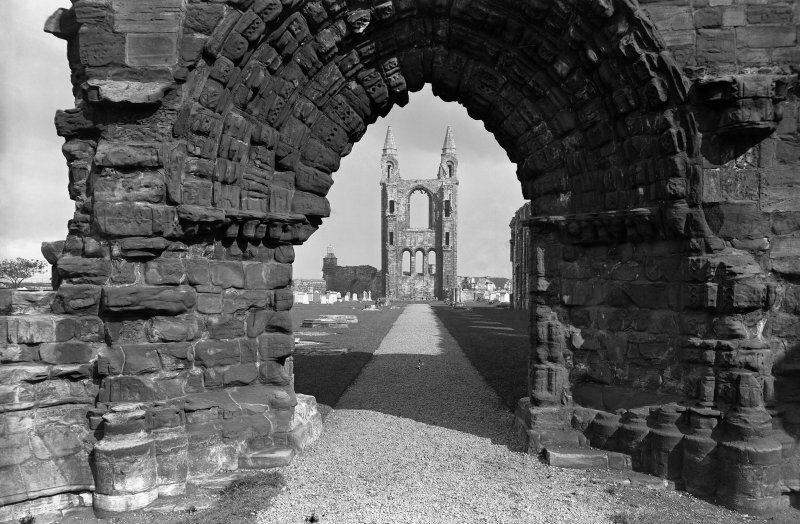 Work may have been delayed by the Wars of Independence but the 'new kyrk cathedralle' was consecrated by Bishop Lamberton in 1318 in the presence of King Robert Bruce. 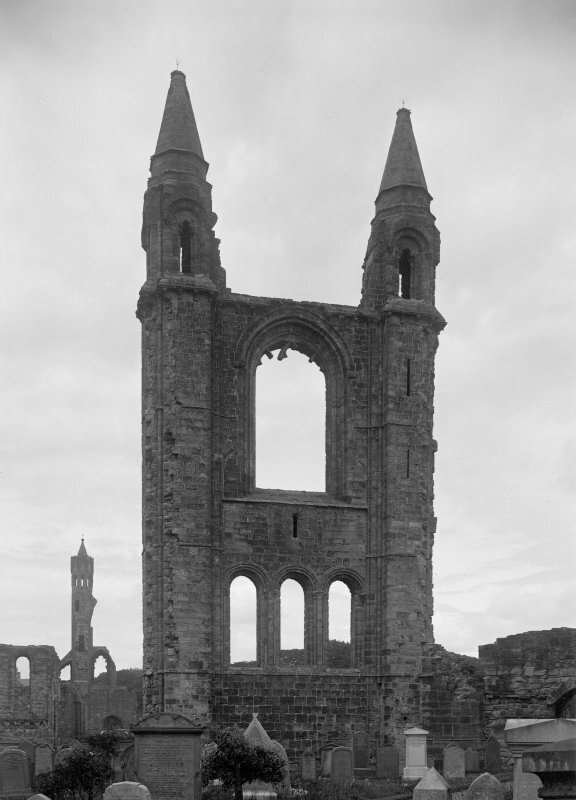 The second half of the 14th century saw the greater part of the cathedral destroyed by fIre. The timber work of the choir and transepts had to be renewed as did a number of piers in the nave and transepts. 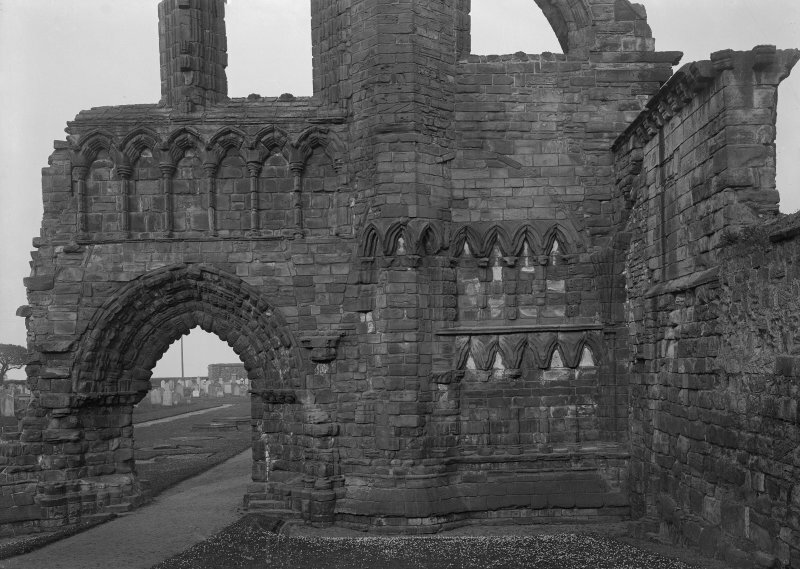 The urgent work of consolidation took seven years to complete and the total damage was not remedied until 1440. 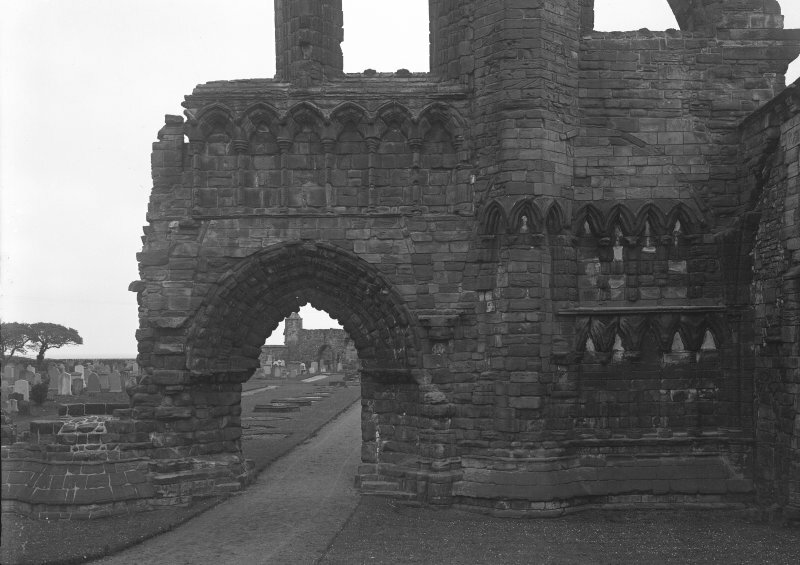 From then until the Reformation the church required only minor repairs. 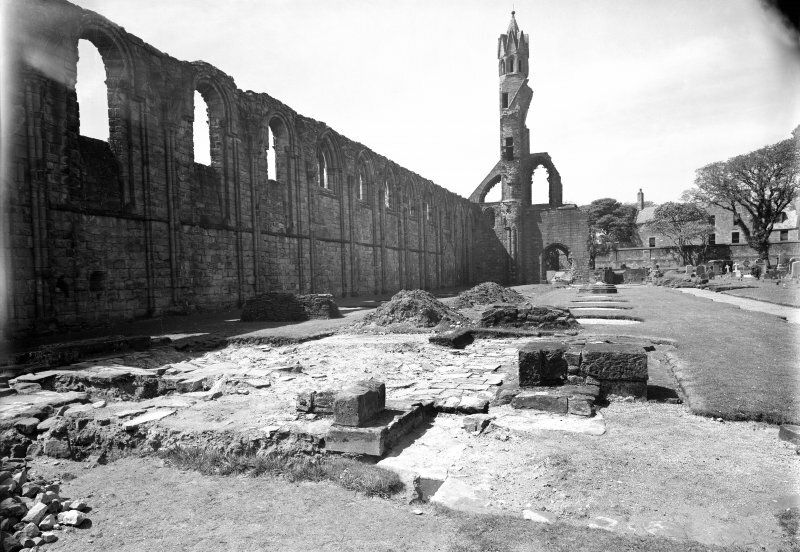 After the Reformation, when it suffered the burning of images and massbooks and the breaking of altars, it was allowed to fall into decay. 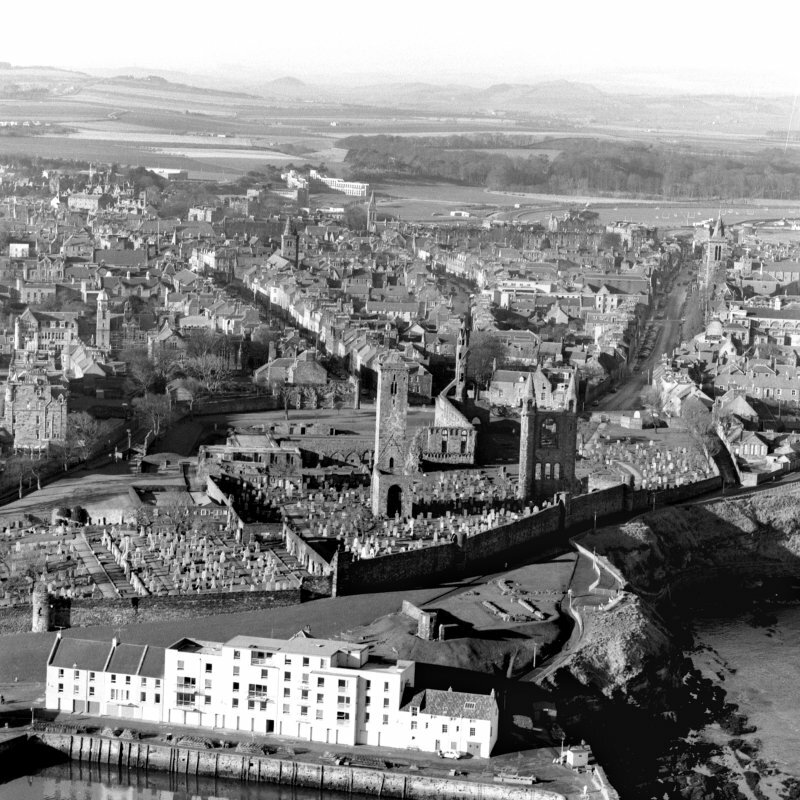 In 1826 the Barons of the Exchequer took possession of the ruins and in 1946 it was given to the State. 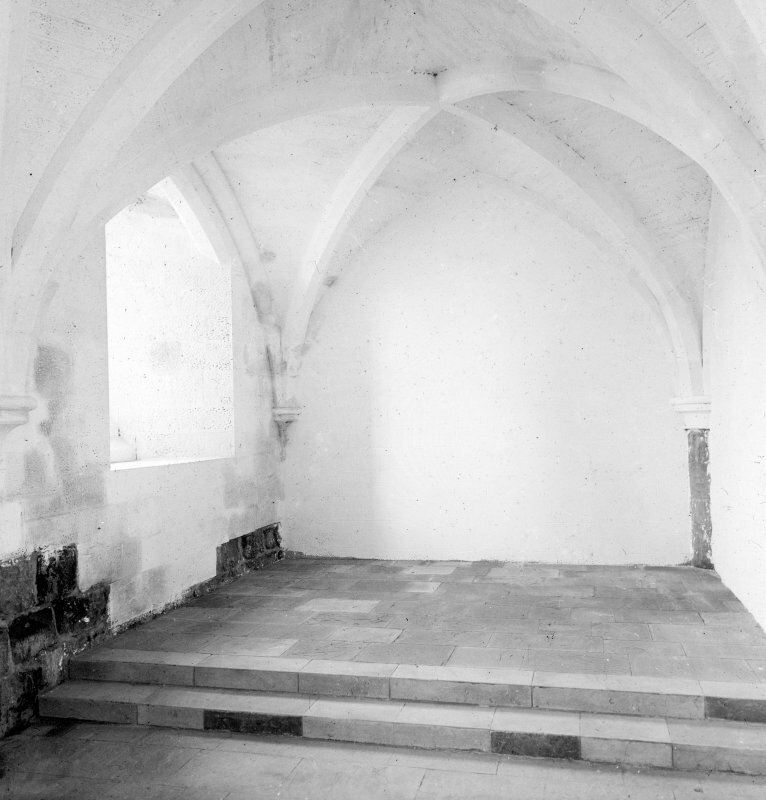 A museum was established in an isolated building commonly called the Prior's House. 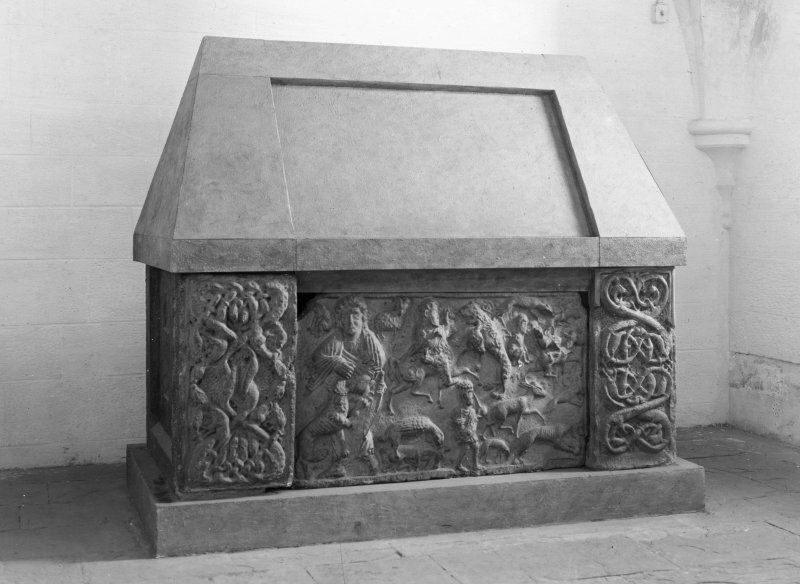 Included amongst the sculpture housed in the museum is an important example of late 8th or early 9th century work known as the St Andrews Sarcophagus, although its function is more likely to have been that of a shrine or reliquary rather than a normal coffin. 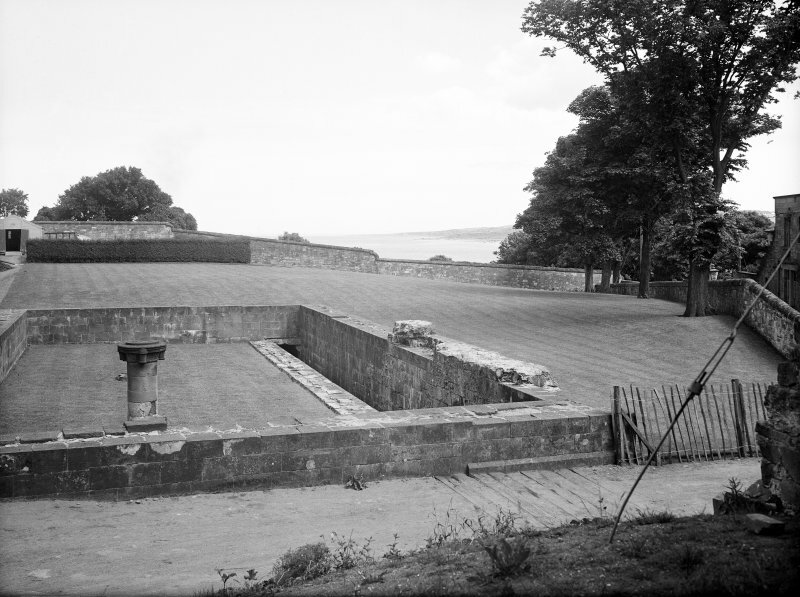 It is a stone box,composed of slabs slotted into corner-posts, and its reconstructed gabled roof is conjectural. 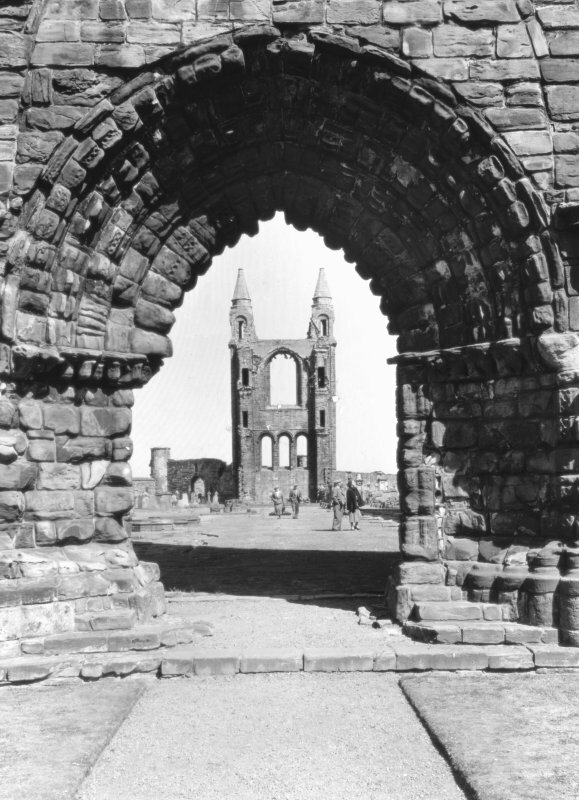 This is the earliest sculpture surviving from St Andrews, despIte its formidable ecclesiastical history; perhaps all trace of an earlier Dark Age church settlement was destroyed at the Reformation. 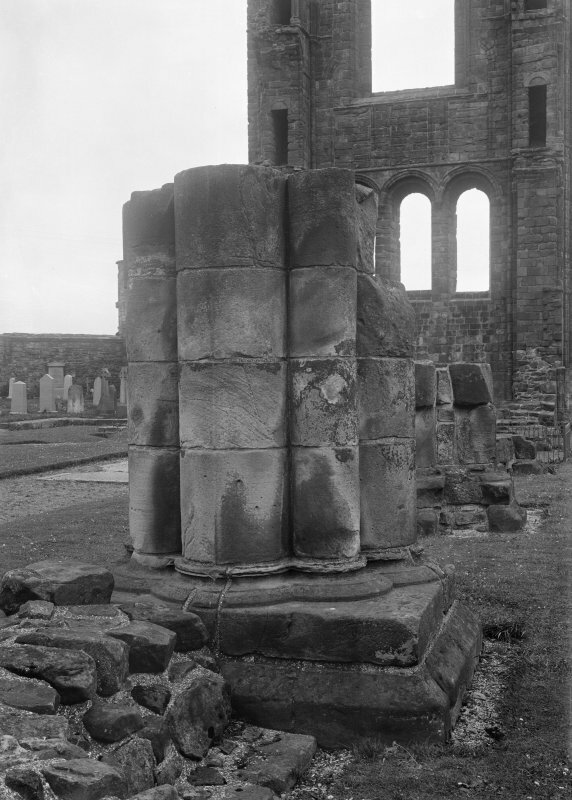 The Sarcophagus consisted originally of four thin sandstone panels fItting into the grooved sides of four substantial corner-posts, but only two panels and three posts have survived. Much of the carving has been carried out in remarkably high relief, and the main long panel represents a major work of David iconography: the human fIgures depict scenes from the biblical life of David, and their treatment shows strong Mediterranean influence. The large fIgure represents David rending the jaws of the lion, the figure on horseback wields a sword in his right hand and a falcon on his left and is under attack from a lion, while the standing fIgure has shield and sword. All three fIgures are dressed in elaborately draped clothing quite unlike the normal Pictish tunics. Exotic elements include the griffon devouring a mule to the left of the large fIgure ofDavid and the pairs of monkeys depicted on the end-panel. The sculptor's mastery of interlace ranges from the animal interlace on the corner posts to the intricate patterning of the cross on the end-panel. 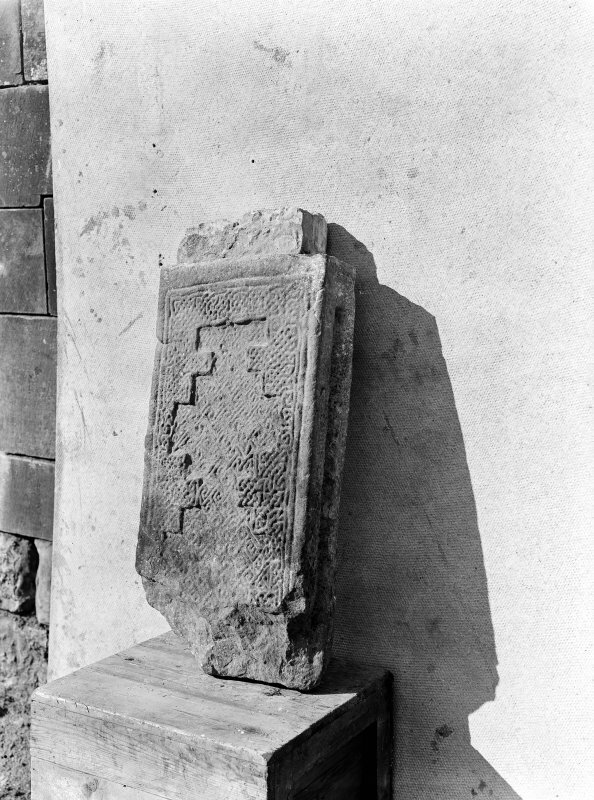 This skill in carving interlace can also be seen on the great cross-shaft (no. 14), where all four sides of the shaft are covered in beautifully executed woven ribbons, and on the shaft of another free-standing cross (no. 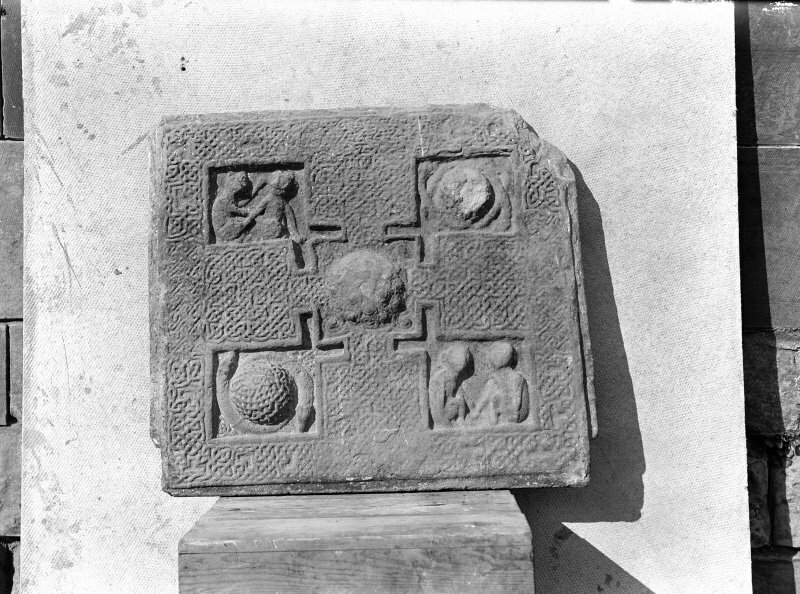 19), both of which may have been created in the 9th century. 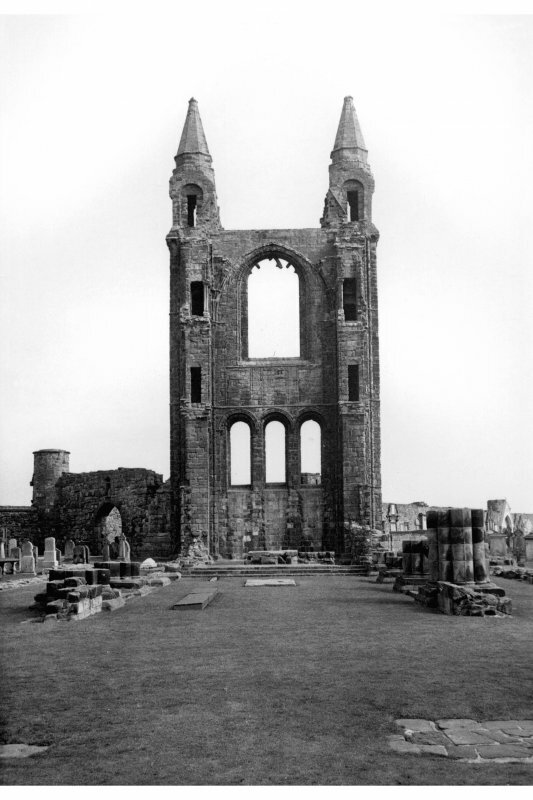 They reflect, together with other sculptural fragments in the museum, the importance of St Andrews in the early medieval period. 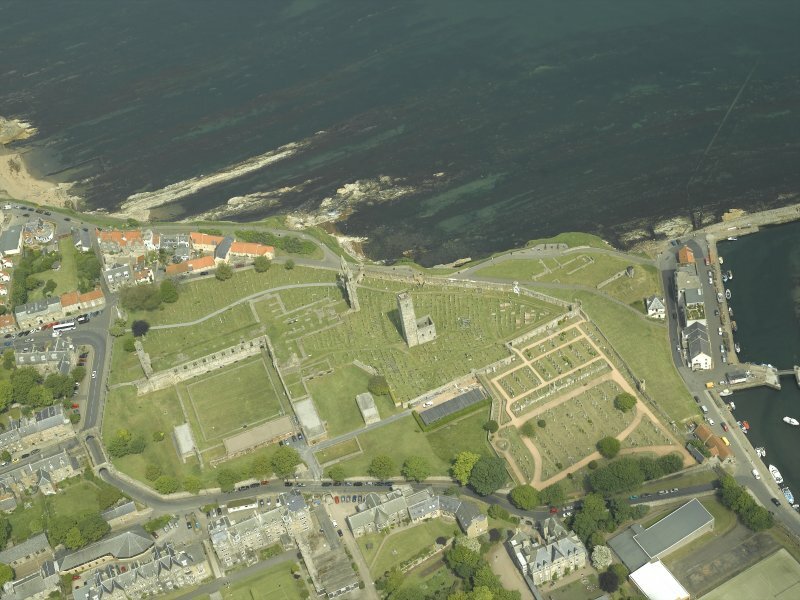 St Rule's Church stands to the south-east of the cathedral. 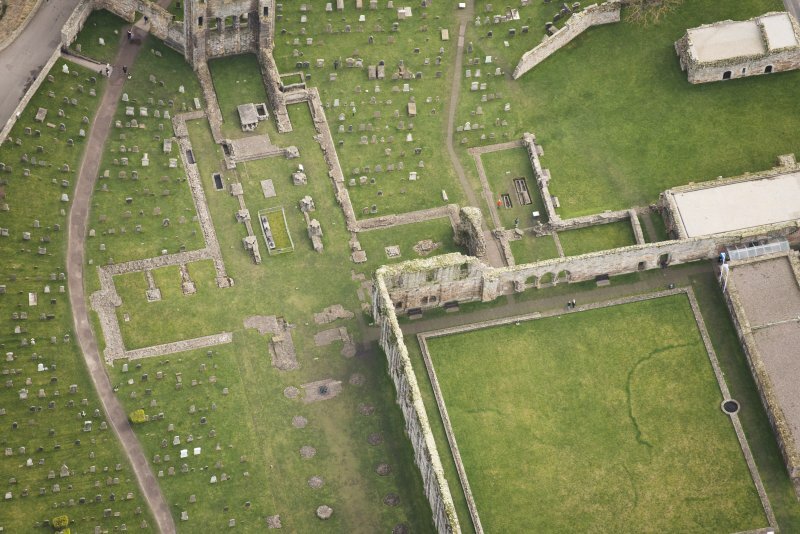 The narrow proportions of the church, its solid walls and minimal windows, suggest similarities to Northumbrian building practice ofpre-Norman Conquest date, although it was probably erected towards the end of the 11th century. 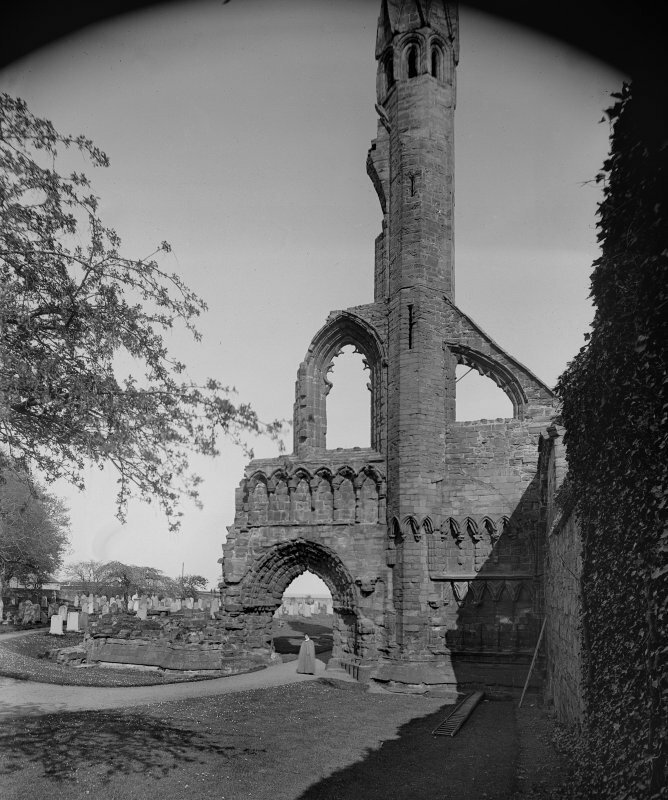 The tall square tower with round headed two-light windows also belongs to the late Anglo-Saxon or early Anglo-Norman period. 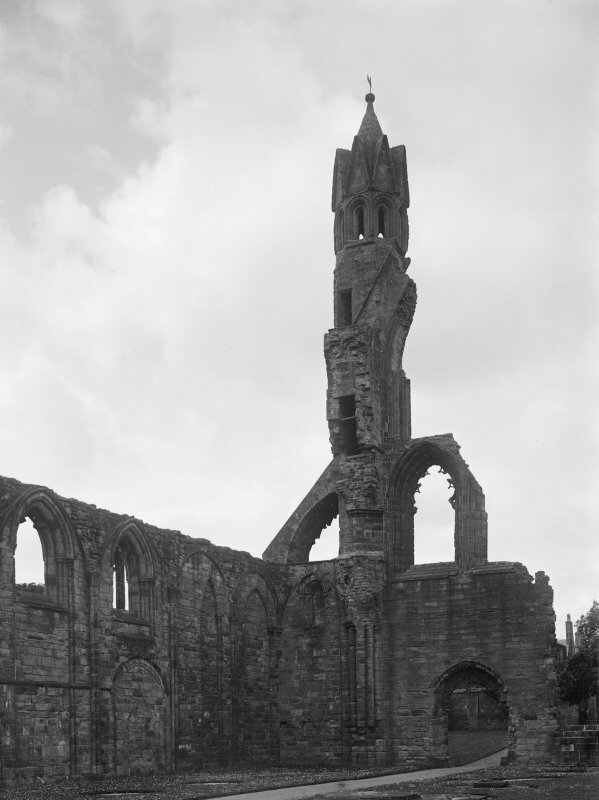 There are similarities between this tower and the tower at Restenneth Priory (no. 65). 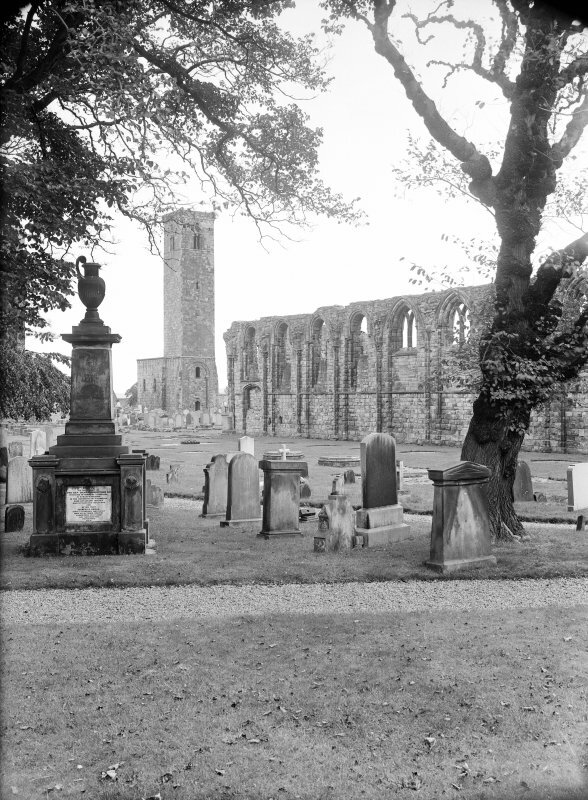 The church towers at Dunning (NO 019144), Markinch (NO 297019) and Muthill (NN 867170) have similar two-light windows. 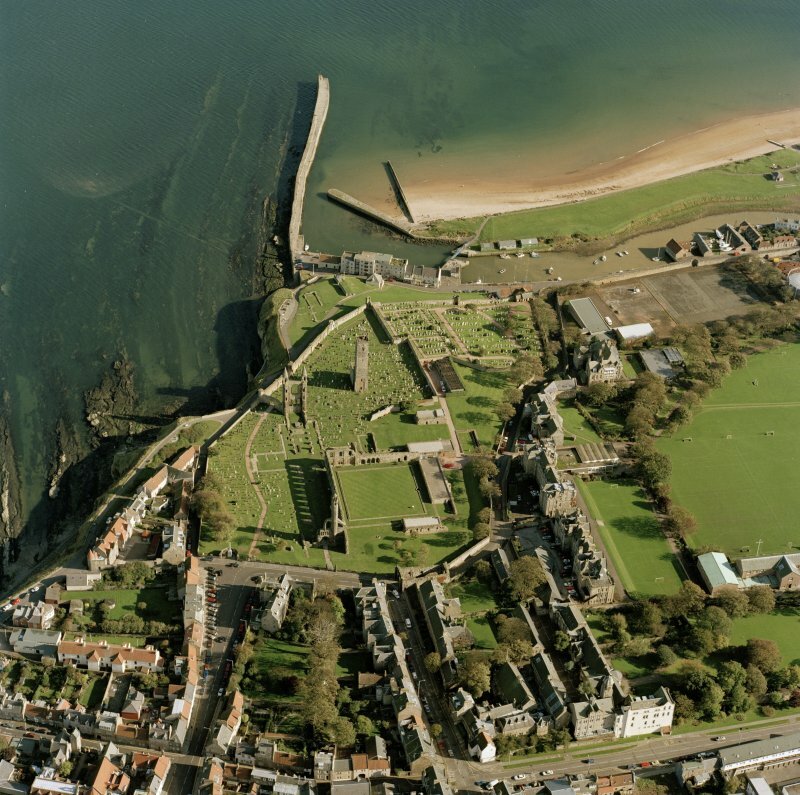 The foundations of the 12th century Culdee church of St Mary of the Rock (NO 515166) can be seen to the east of the cathedral and St Rule's Church, between the perimeter wall and the harbour. NO 51415 16687 This is a substantial collection of carved stone, and most of the examples are of a very high quality. 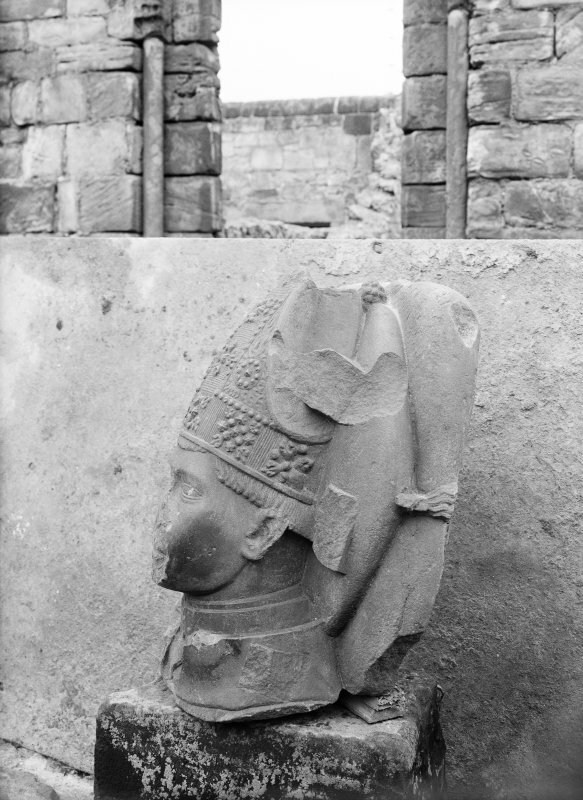 It includes large numbers of column capitals dating from the 12th to 16th century, as well as numerous tomb slabs, voussoirs, vault ribs and sculptural pieces. One of the most interesting finds in this collection is an early 13th-century column base. 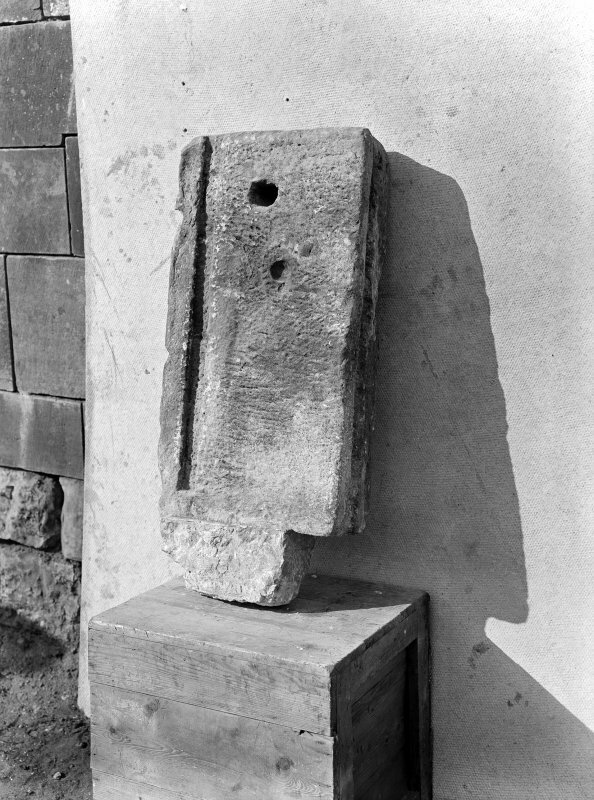 It is possible that this stone was never used, since its moulded edge has an unfinished appearance, and some areas on the upper face are rather roughly finished. In addition, three sub-bases on the upper surface are irregular in appearance, with a notable asymmetry. The underside of the base shows intriguing evidence of design processes in the early 13th century. 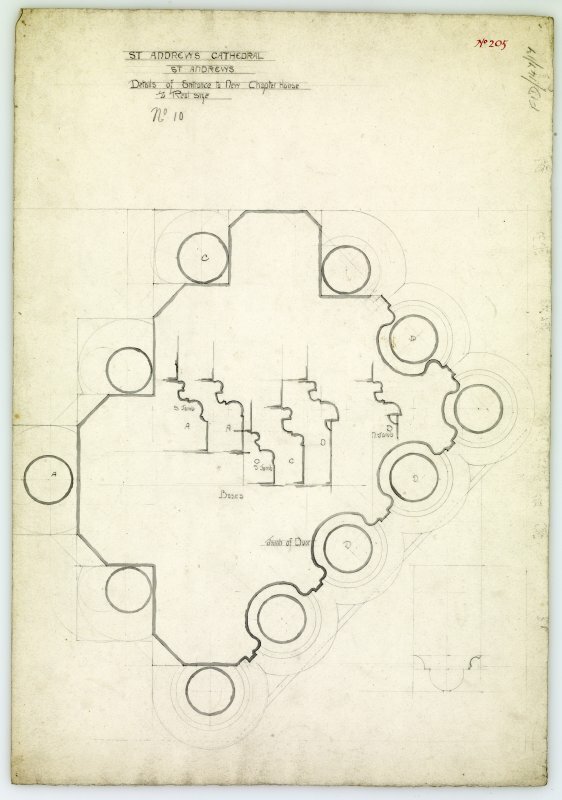 There are several drawn and scribed lines, showing the design of the sub-bases on the upper surface, as well as plans of walls with attached columns. Compasses have been used to form the column design, which was initially drawn, then scribed for use as a template. 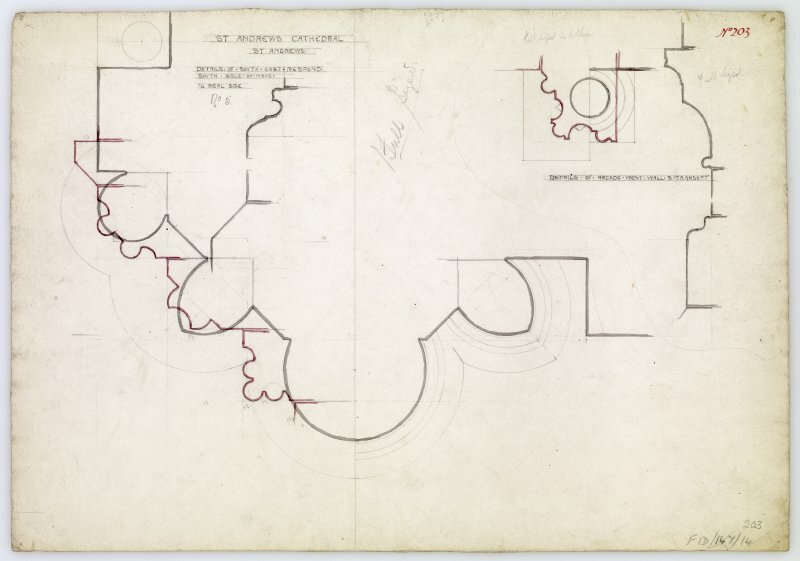 Measuring both the scribed/drawn template and the quatrefoiled bases on the upper surface shows that they are almost exactly the same size, providing a very rare example of both a planned and executed design. 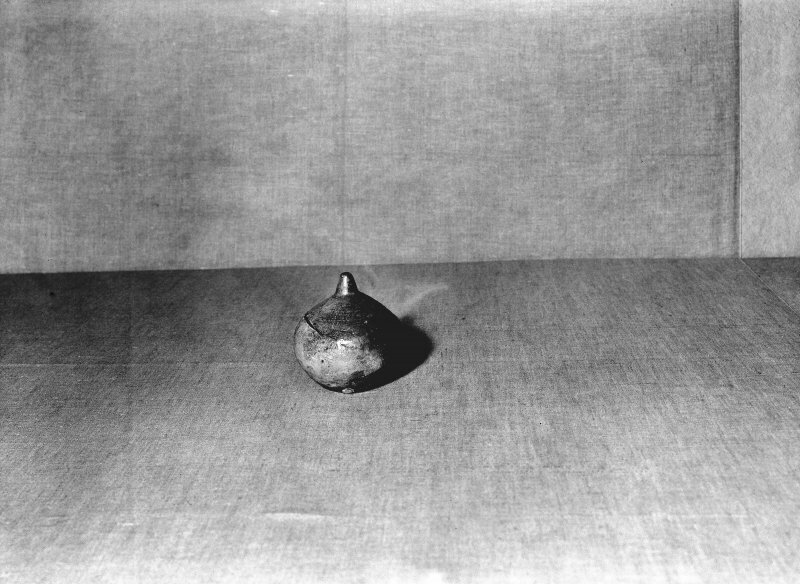 An assessment of the collection began in June 2008 and is ongoing. 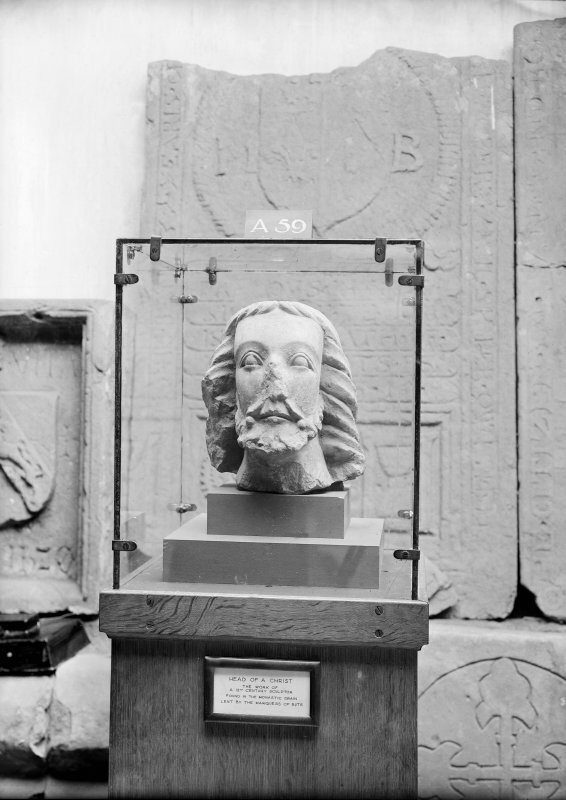 NO 51415 16687 This collection of a large number of post-reformation tomb slabs and a group of architectural fragments was catalogued June 2008–March 2010 and is now on display in the cathedral museum. 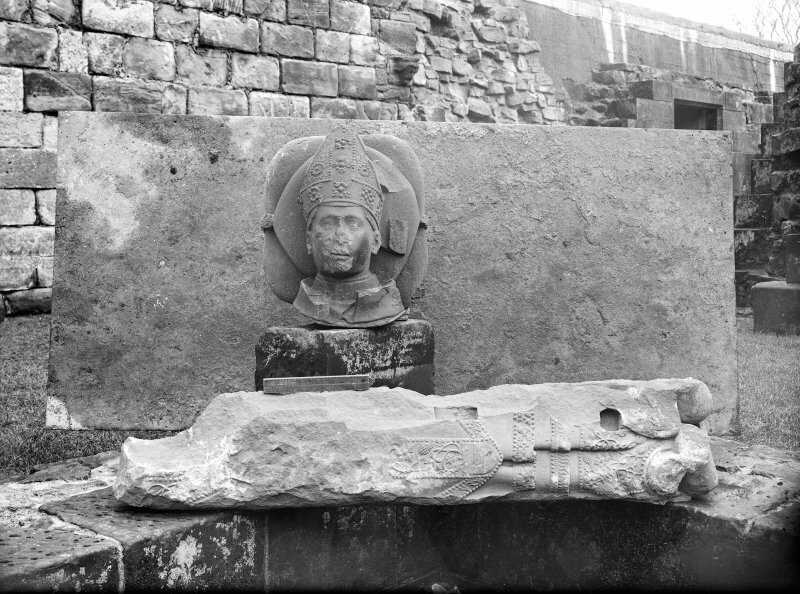 Among the architectural fragments are two very well preserved pieces of cornice. One of these shows a series of grotesque heads connected by a stem of vegetation. The stem is portrayed descending through the top of each head and re-appearing through the mouth to descend to the head below. The cornice is worked in very fine-grained sandstone, which has allowed the detail to be carved with a great degree of freedom and delicacy. The other cornice is more stylised in form, with a row of rectangular foliage and berry forms, again connected by a stem of vegetation. 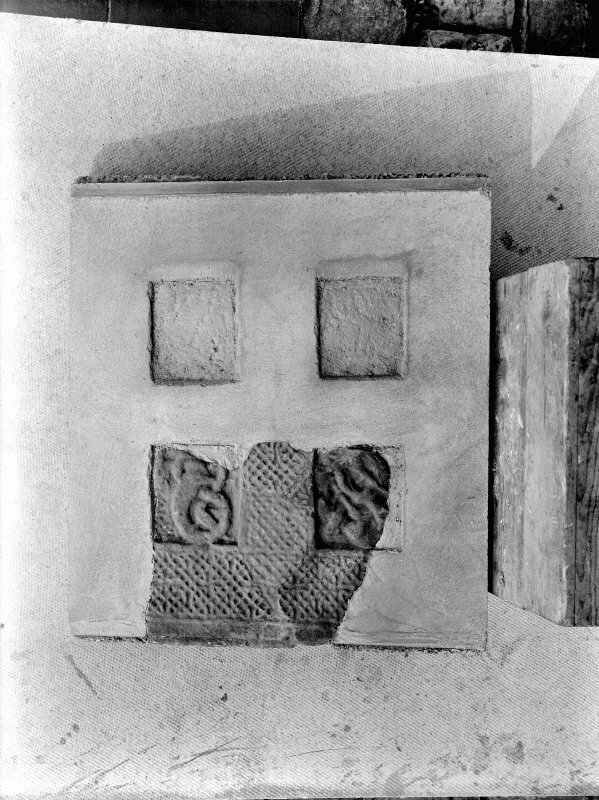 The coarser grade of this sandstone has clearly affected the manner of the carving, with a stronger sense of regularised pattern-making compensating for the relative simplicity of the carved detail. Among the tomb slabs, there are many fine examples of symbols of mortality, trades, heraldry and inscriptions, such as the tomb of Christian Wood (d 1636), which includes a skeleton with ‘memento mori’ on a scroll above its head. 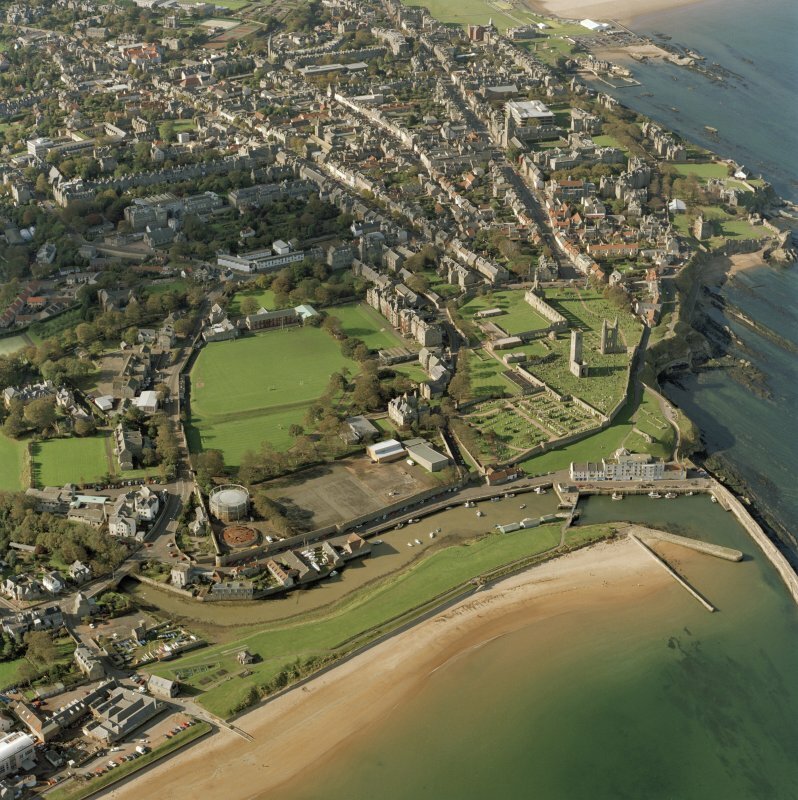 A watching brief was maintained during the digging of four trenches to house new sign boards at St. Andrews Cathedral, Fife. A record was also made of the removal of an existing sign. As to be expected on a site of such historical importance with a long history of occupation, even these relatively shallow trenches threw up evidence from the distant past in the form of a fragment of medieval floor tile. 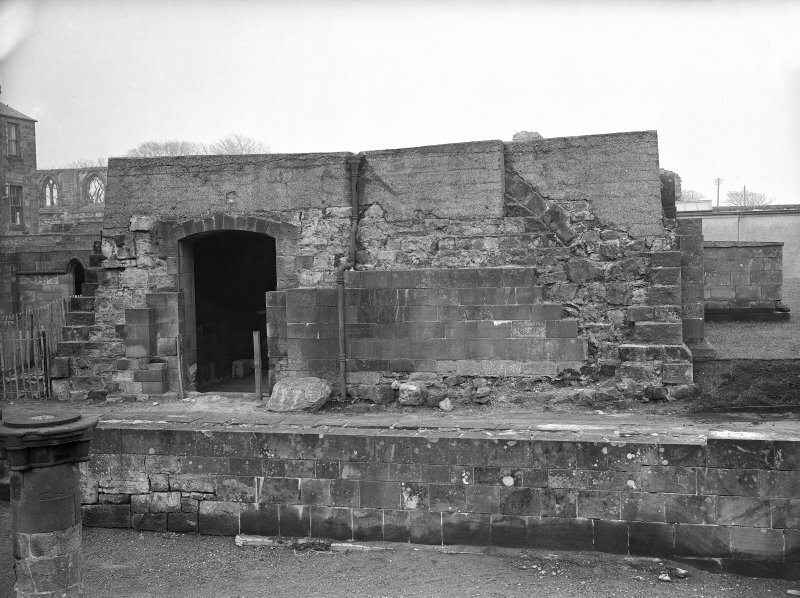 Little else of archaeological significance was recovered during the course of these works, however given the site's importance and the undoubted extensive archaeological deposits that survive relatively close to the ground surface, any future ground-breaking works should be carried out under close archaeological supervision.